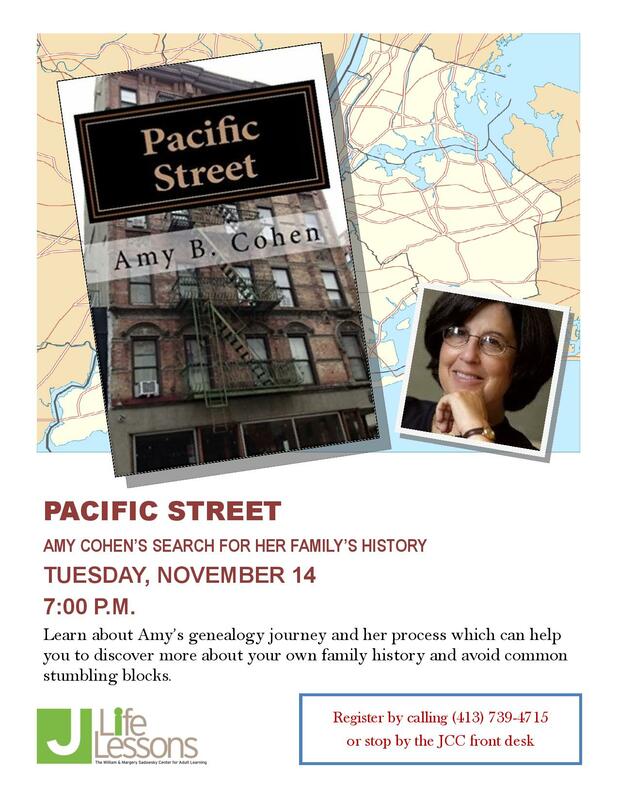 Next Tuesday I will be giving a presentation at the Springfield JCC about my genealogy research and about my novel, Pacific Street. I will be talking about why I started researching my family’s history, providing some tips and suggestions for others who might want to do the same, describing two of the mysteries I solved through genealogy research, and talking about why I decided to write a novel about my grandparents’ lives. If you live near Springfield, Massachusetts, I hope you will consider coming. The presentation is free, and there will be refreshments provided. The program begins at 7 pm and will be over by 8 pm. Please join me if you can. I would love to see any and all of my blog readers and cousins! 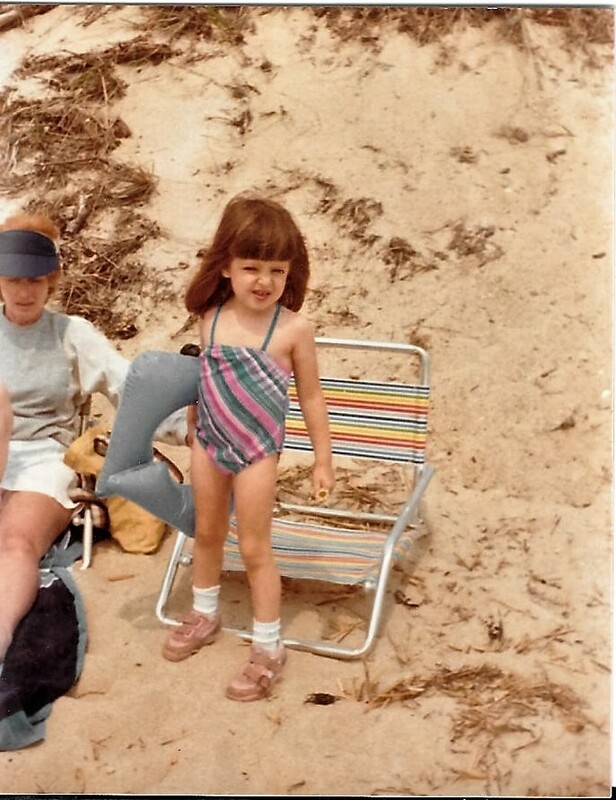 My mother has often spoken about how sad she was when her family decided to move from Brooklyn to the Bronx when she was about twelve years old. There were many reasons she was upset. 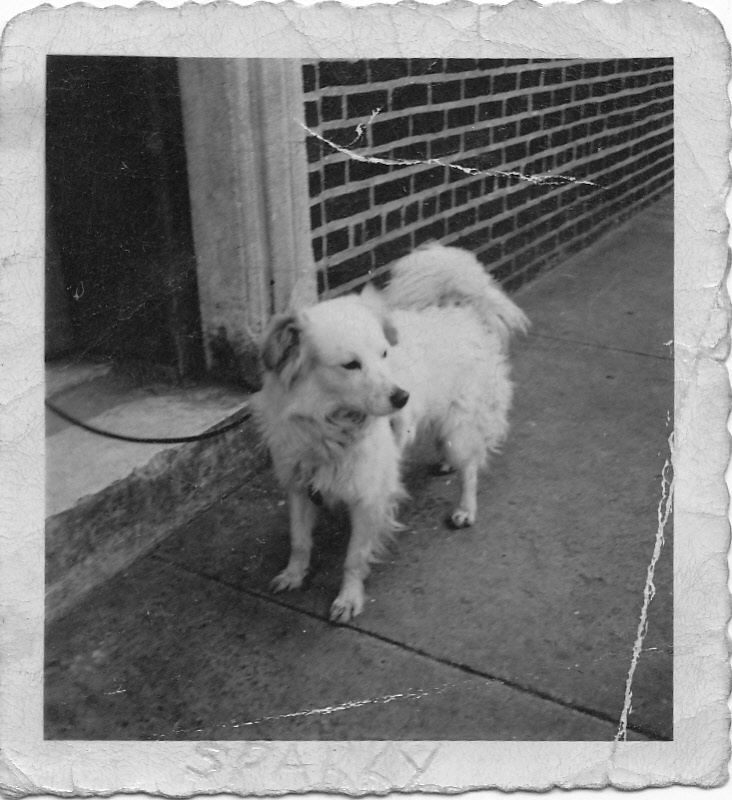 For one, she had to leave her dog Sparky behind. That broke her heart, and she still can’t talk about it without getting emotional. But also she had to leave her best friend Beatty behind. Beatty lived in the same four-family house at 1010 Rutland Road in Brooklyn; she lived right down the hall from my mother. 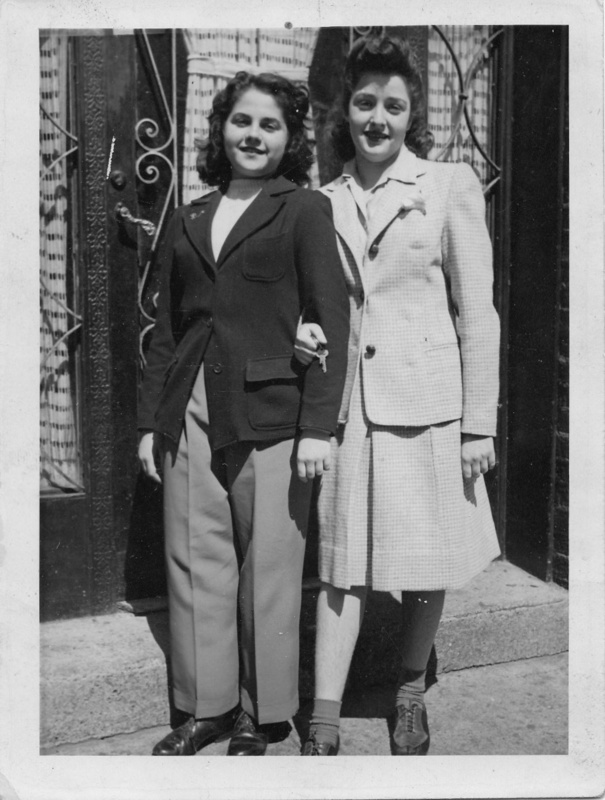 They had been close friends all through childhood, and although they tried to stay in touch after my mother moved, back in the 1940s that was not at all easy. Phone calls were expensive, and the trip from Brooklyn to Parkchester in the Bronx was a long one, especially for two young girls. So over time, they lost touch. Not too long ago my mother asked me if I could find Beatty. She knew her first and last name from when she’d last seen her over 70 years earlier, but she had no idea where she was living or whom she might have married. I tried to find her, but with so little information I had no luck. If Beatty had married, it was after the last year of the publicly available NYC marriage index (1937). The only information I could find related to her siblings, who had passed away. So you can imagine how excited I was to receive a message on the blog last week from Beatty herself. She was looking for my mother after seeing her pictures and childhood name on the blog. I contacted Beatty, and I called my mother. And I gave them each other’s contact information, and now they are reconnected after over 70 years. I get the chills (and a warm feeling) whenever I think about it. 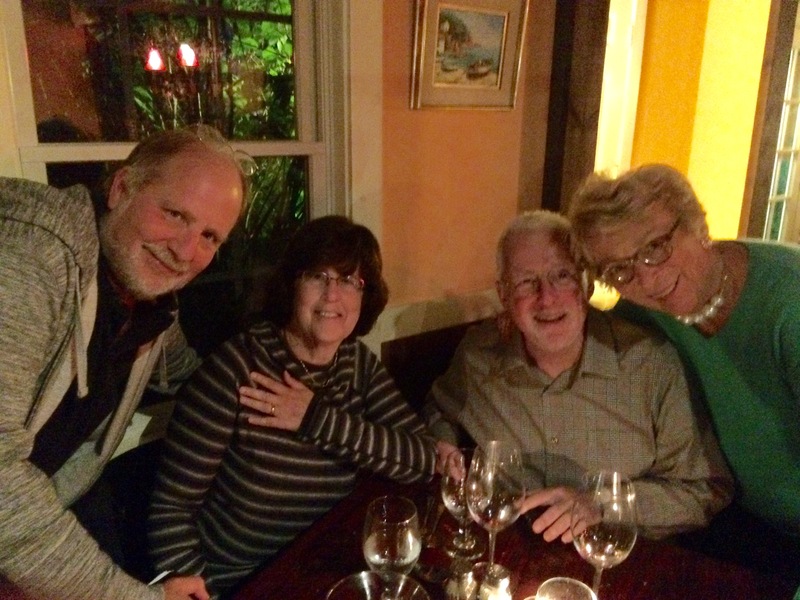 One of the stories my mother shared with me was about Passover at Beatty’s house. Her father led the seder in a very serious way, and as many of us know, a traditional seder can get quite long and quite boring, especially for young children. 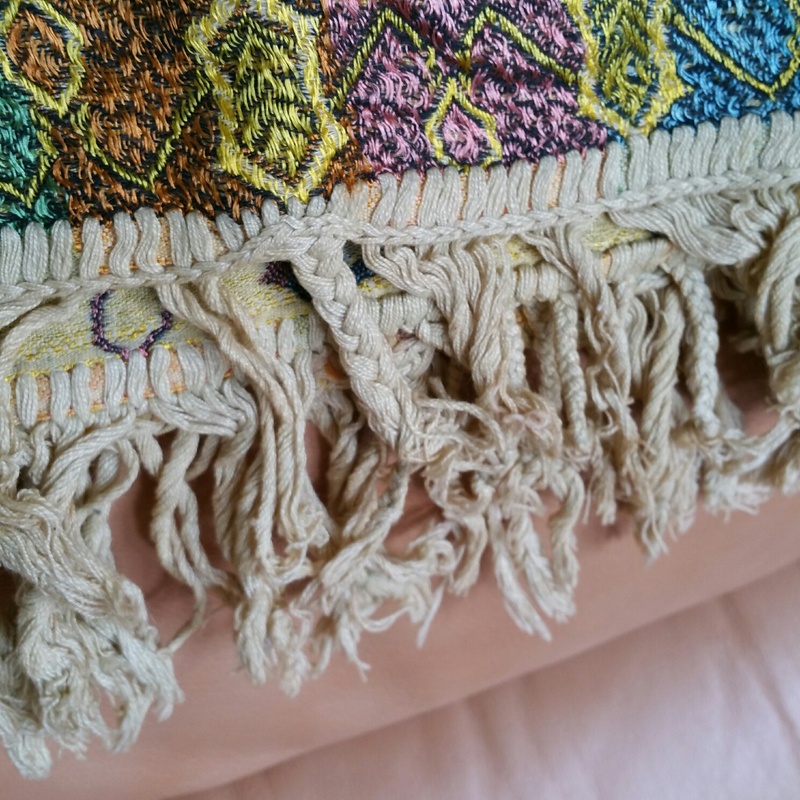 To keep themselves from misbehaving and talking, my mother and Beatty would braid the fringes on the beautiful tablecloth that adorned the seder table. 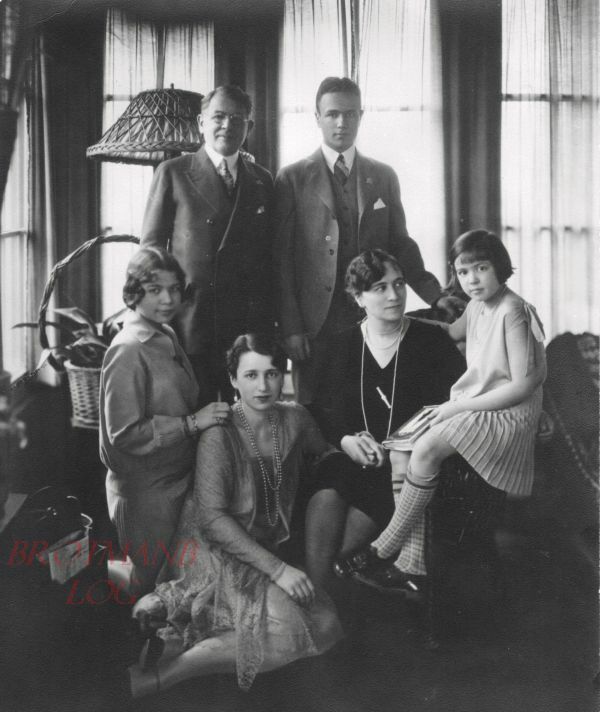 When my mother shared this memory with Beatty, she said that she also had shared that story with her children. The tablecloth still exists, and even more remarkable, the braids made by my mother and her best friend Beatty are still there as well. Here is the photograph to prove it. 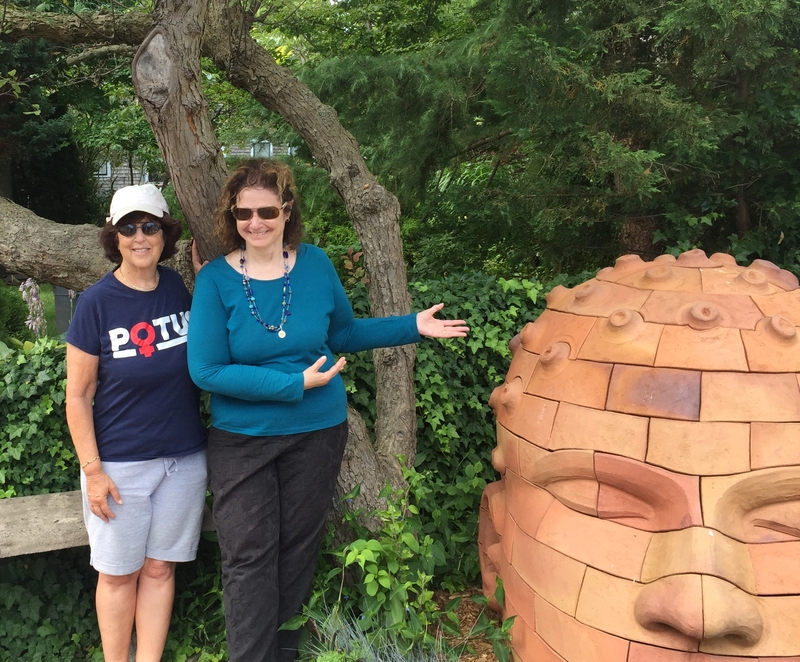 My mother was once my Girl Scout troop leader, and one of the songs we sang had the lyrics, “Make new friends, but keep the old. One is silver, and the other gold.” My mother and Beatty certainly know the truth of that message. 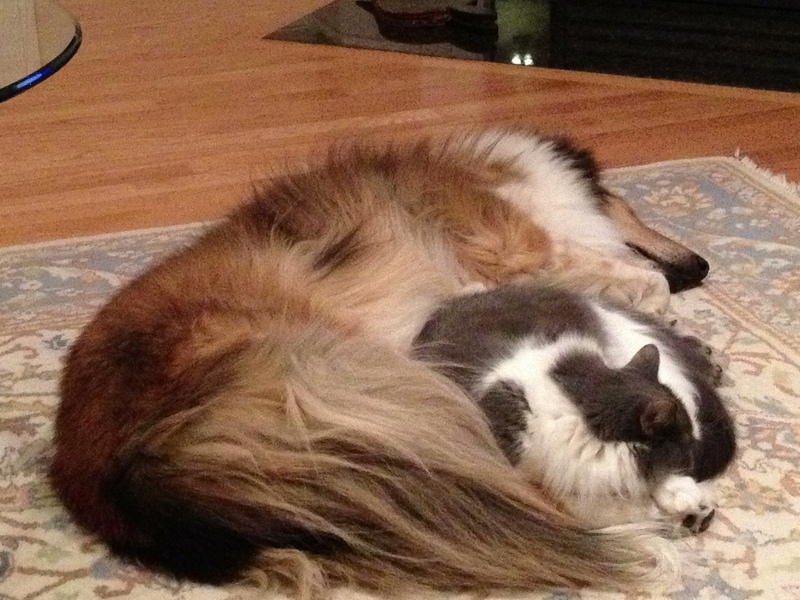 As many of you know, we lost two pets in the last twelve months. First, we unexpectedly lost our sweet cat Luna, who died without warning last September. 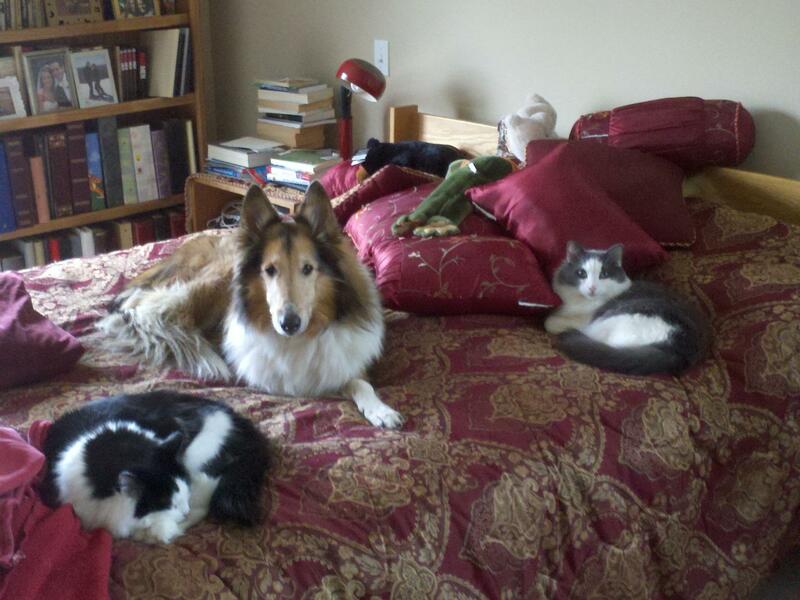 Then in June we had to put down our fifteen year old dog Cassie. 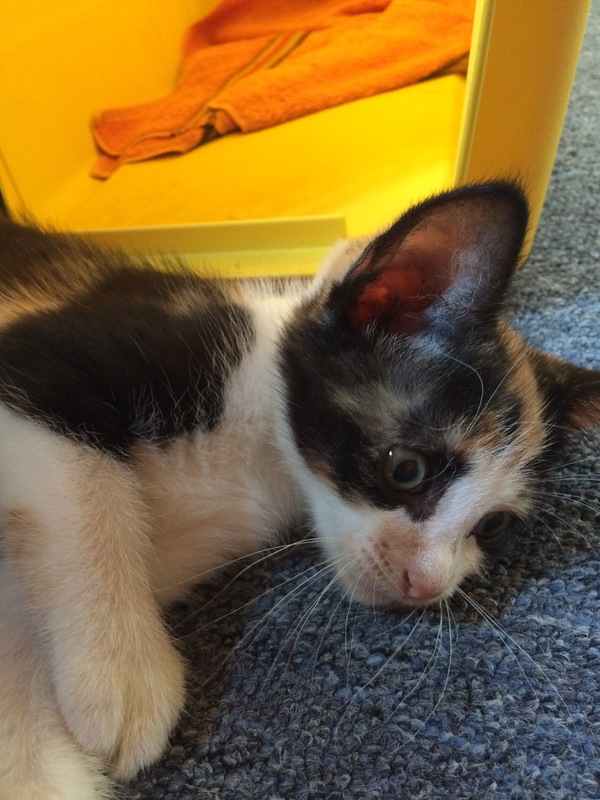 I knew we would eventually get a new cat, but I really wasn’t ready until after we lost Cassie as well. 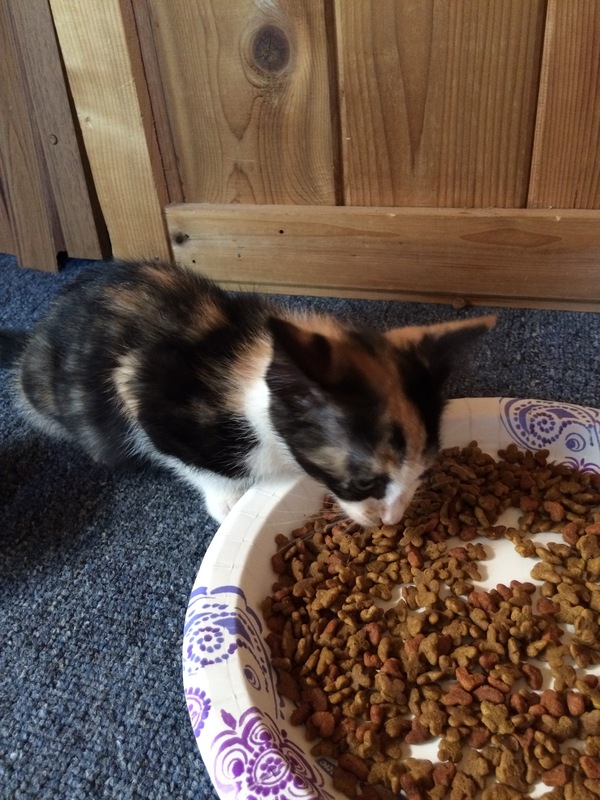 So for my birthday, all I really wanted was a kitten. 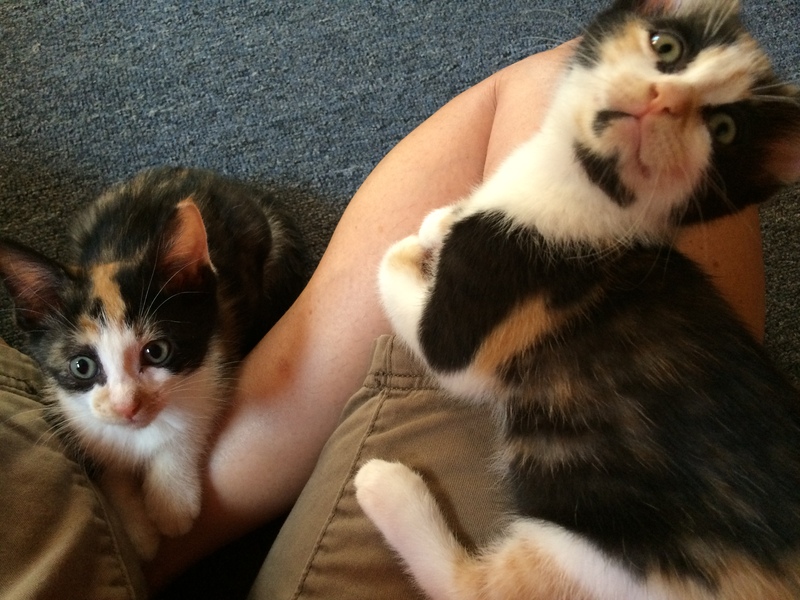 Um, I mean kittens. 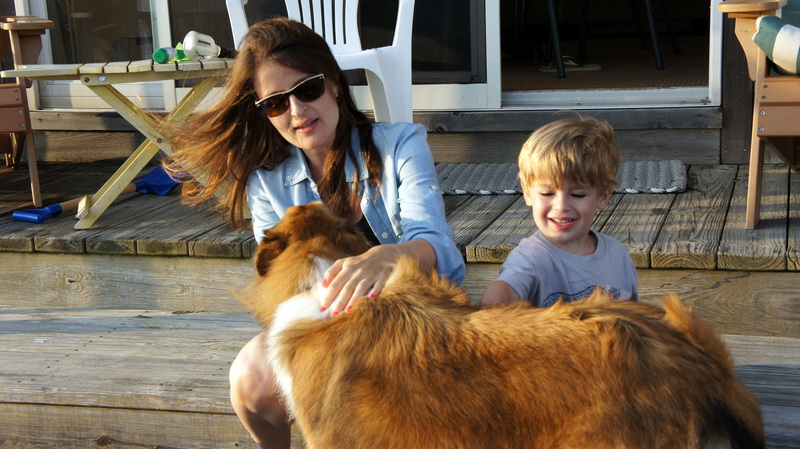 We were very lucky to find an amazing animal shelter in Provincetown called CASAS. 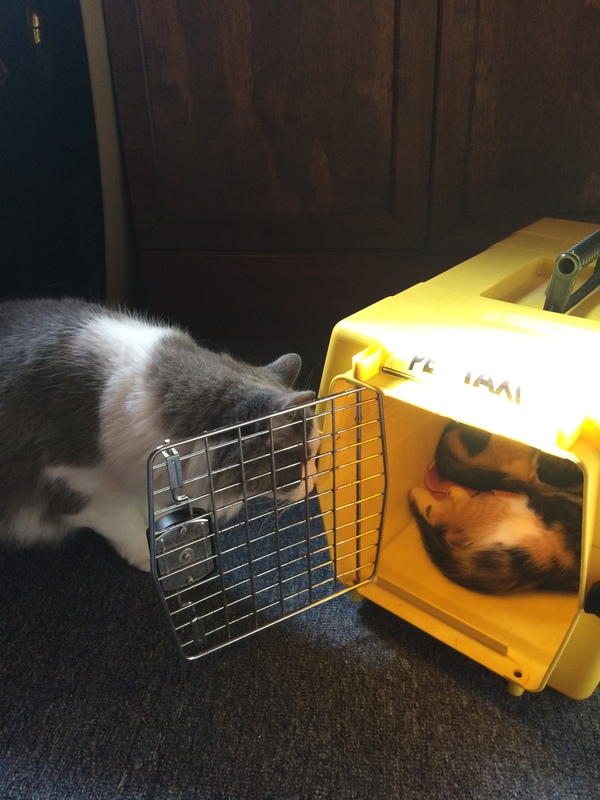 It’s a no-kill shelter where the cats have free run of a house, no cages. It’s run by volunteers and supported by donations. It’s the only shelter I’ve been to where I did not leave in tears, worrying about all the cats and dogs left behind. 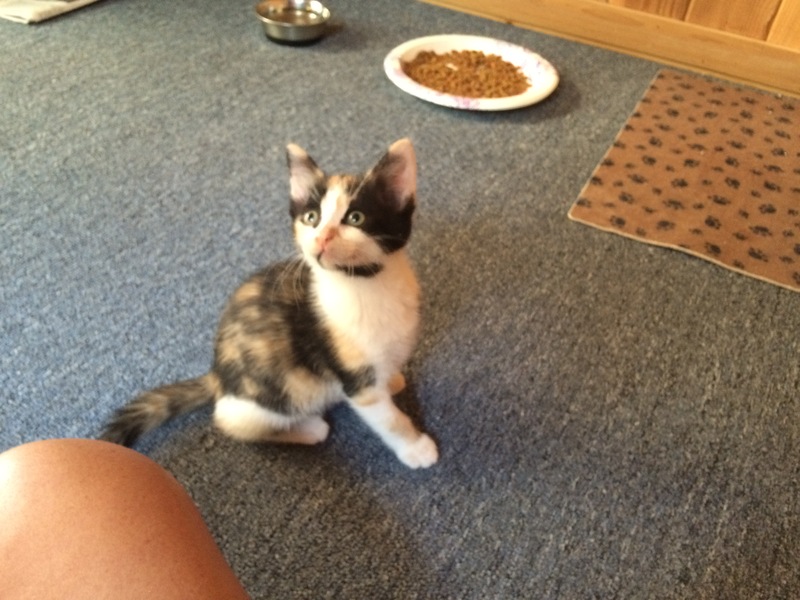 We first saw our new kittens the first week in August and decided we would adopt one. 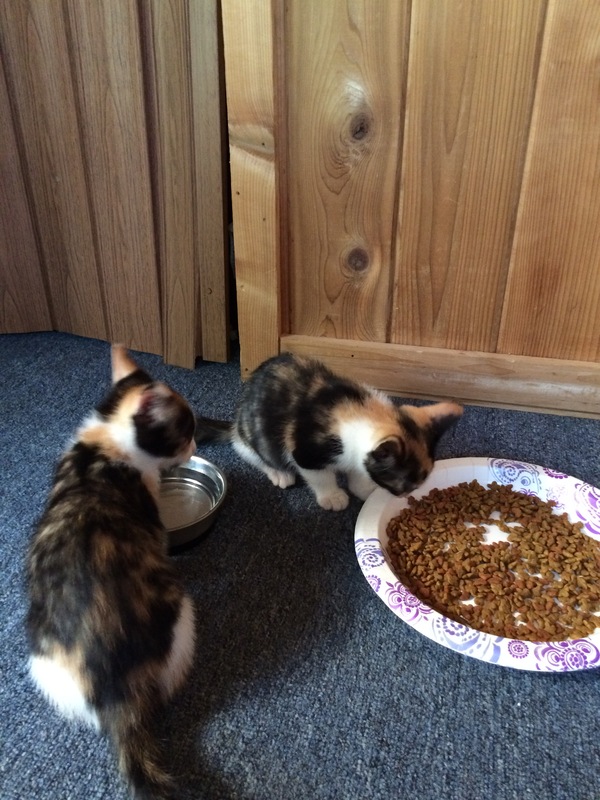 Then a few days later, we decided we should get two. We had to wait until today for them to be ready to go home. These poor kittens were orphaned at four weeks old when their mother was killed by a car and were bottle-fed by the shelter volunteers. They are as sweet as they are pretty. 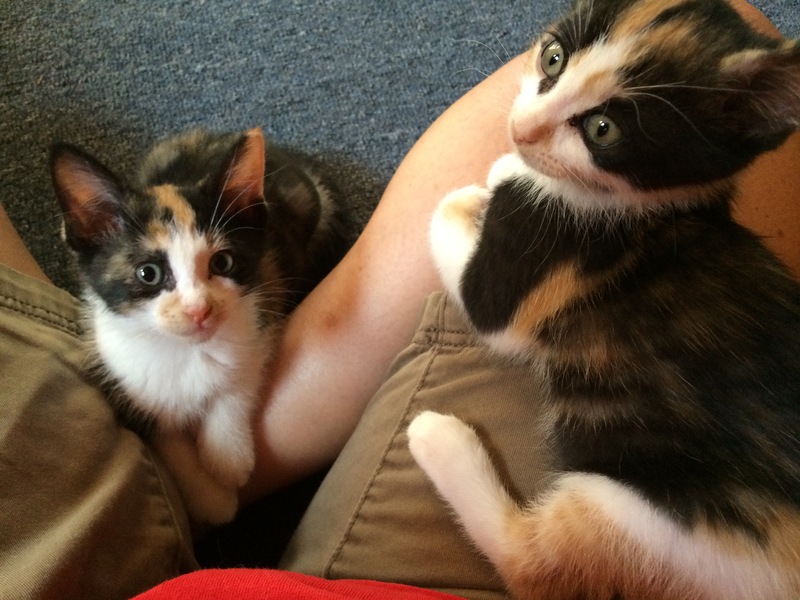 Here they are on my lap. And here’s big brother Smokey checking them out while they slept. And here are a few more as they check out their new surroundings. 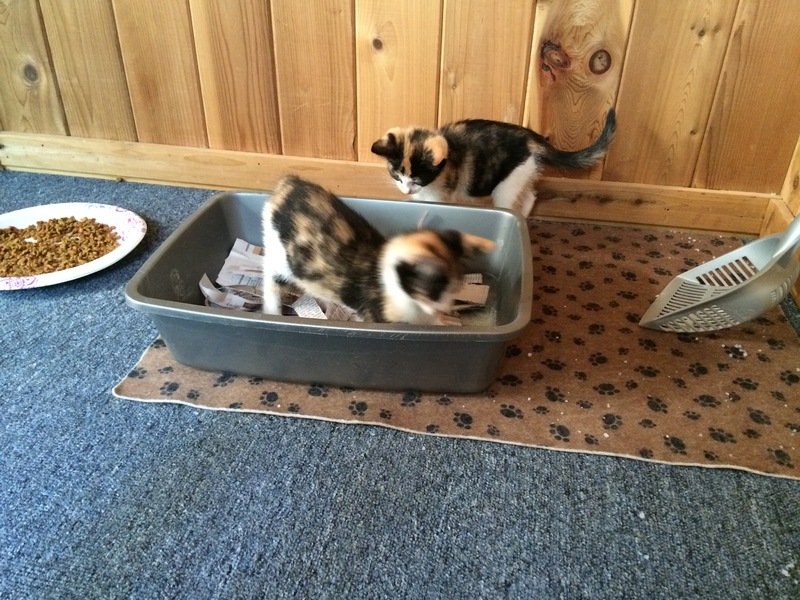 After they both tried to eat the crystal-type kitty litter, we had to use newspaper until we could get some traditional litter. We are so excited to have our new babies join our family! 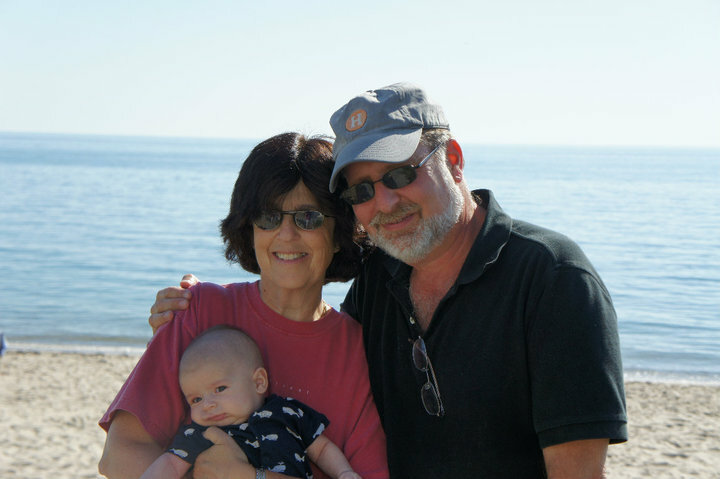 In my last post, I wrote about the family of Marx and Sarah Seligman. 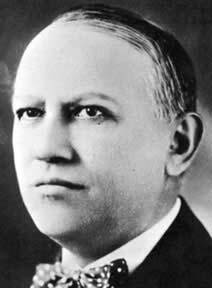 One of their daughters, Charlotte, had married Max Schlesinger, who worked in the tie industry, and they had had four children, including a daughter Harriet, born 1875. 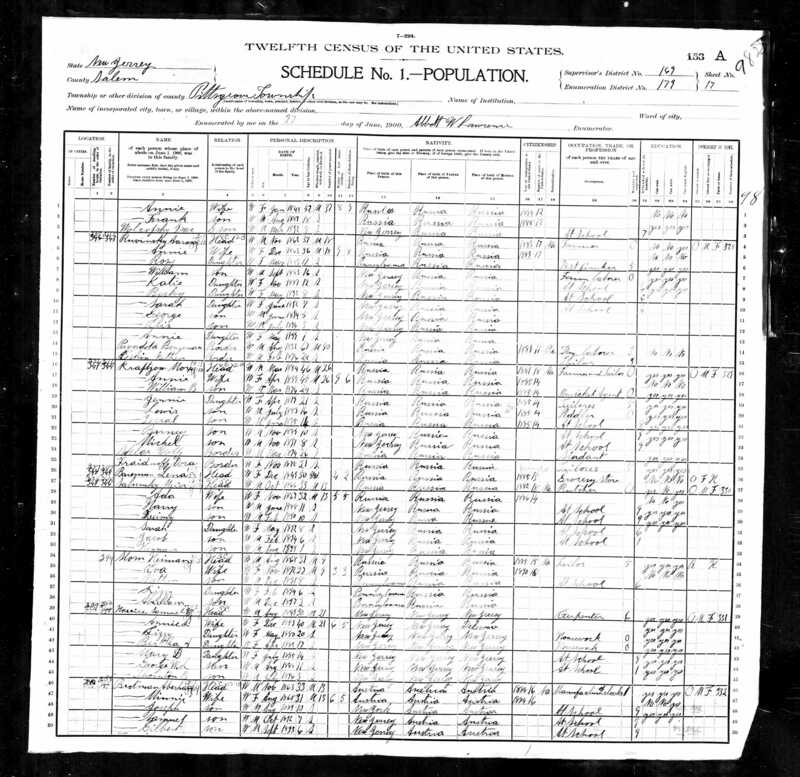 Harriet had married George Cain in 1897, and on the 1900 census, George and Harriet had one daughter, Edith, born in May, 1900, just a month before the census was taken in June. George’s sister Lucie was also living with them. 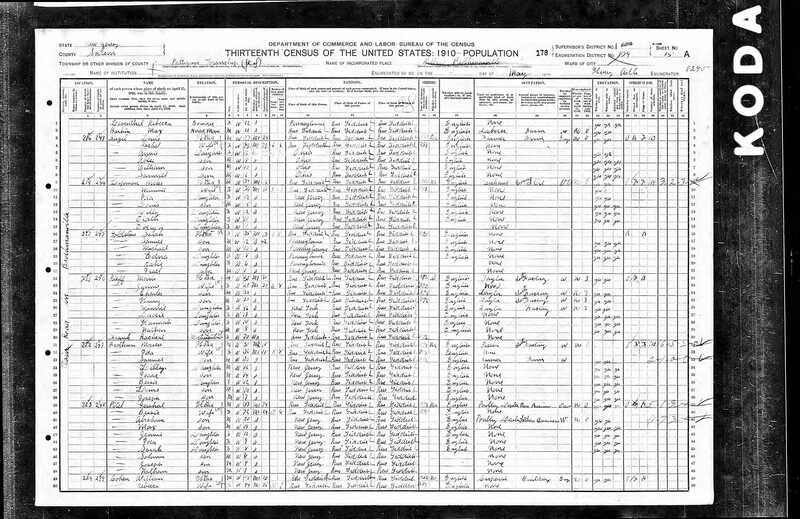 When I found Harriet and George on the 1910 census, I was bewildered. There were now two daughters, Lucy [sic], aged nine, and Ethel, age eight. What had happened to Edith? At first I thought the census taker had just listed Edith by the wrong name. But then the ages didn’t make sense. Then I thought Lucie was born in 1901, a year after Edith, and then Ethel in 1902. But where was Edith? Had Edith died? Plus on the 1900 census Harriet reported that she had had one child and one alive, and on the 1910 census she reported that she’d had two children, and two were alive. 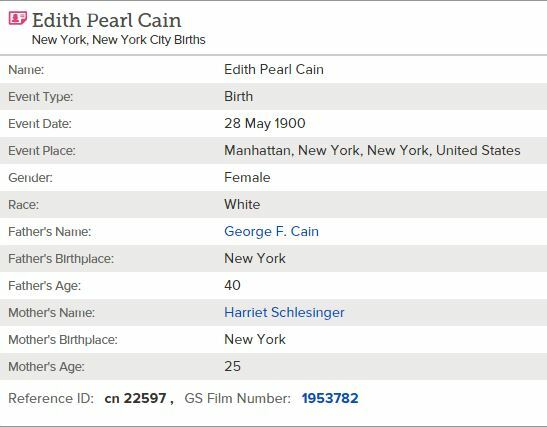 I searched on both Ancestry and on FamilySearch, and I didn’t find any death certificates for a child named Edith Cain between 1900 and 1910. But I did turn up something strange. 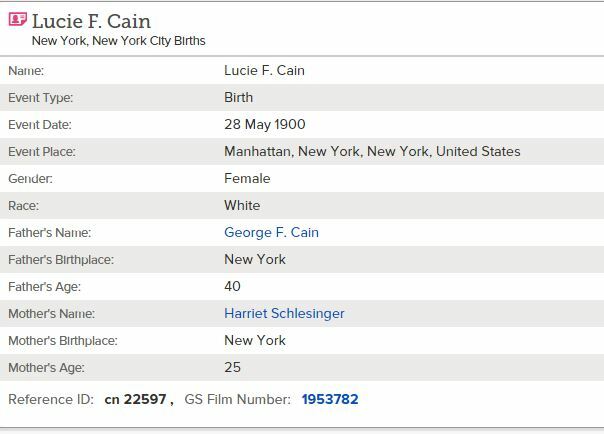 FamilySearch had two New York City birth records for daughters born to Harriet Schlesinger and George Cain on the same day, May 28, 1900, one named Edith, one named Lucie. So where was Lucie in 1900? Maybe she had been sick and in a hospital when the census was taken? But then where was Edith in 1910? Had there been twins? Had Edith died? What really puzzled me was that both records had the same certificate number. Usually if there were twins, there would be two separate certificates each with its own unique number. But all FamilySearch had were these summaries of the certificates, not images of the actual certificates. I turned to the New York City Genealogy group on Facebook for some insights. 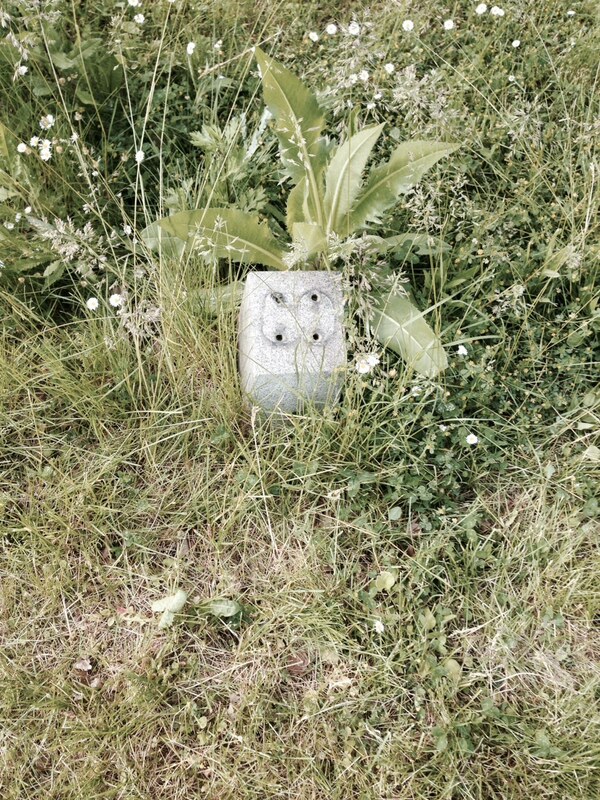 People there were just as mystified, but one group member, Jim Murray, offered to help. He was going to the NYC archives two days later and offered to look up and transcribe the two certificates. What Jim found was that the two certificates were the same as described on FamilySearch, and in addition they had different home addresses for the family. The one for Edith had 166 W. 122nd St. as the father’s address; the one for Lucie had 202 W. 123rd St. as the father’s address. 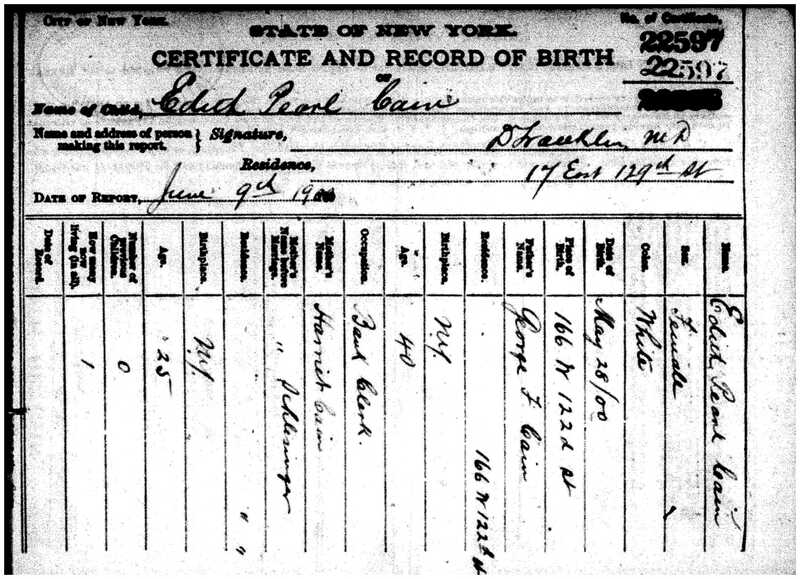 I went back to the 1900 census and found that the family was living at 166 W. 122nd Street on June 9, 1900, when the census was taken, just twelve days after the baby or babies were born. I asked Jim if he had noticed the dates that each certificate was filed, and he said he would go back and check. In the meantime, I had a brainstorm. What had happened to Lucie, George’s sister, between 1900 and 1910? Had she married? She was no longer living with George and Harriet. A few more clicks on Ancestry, and I found out why. 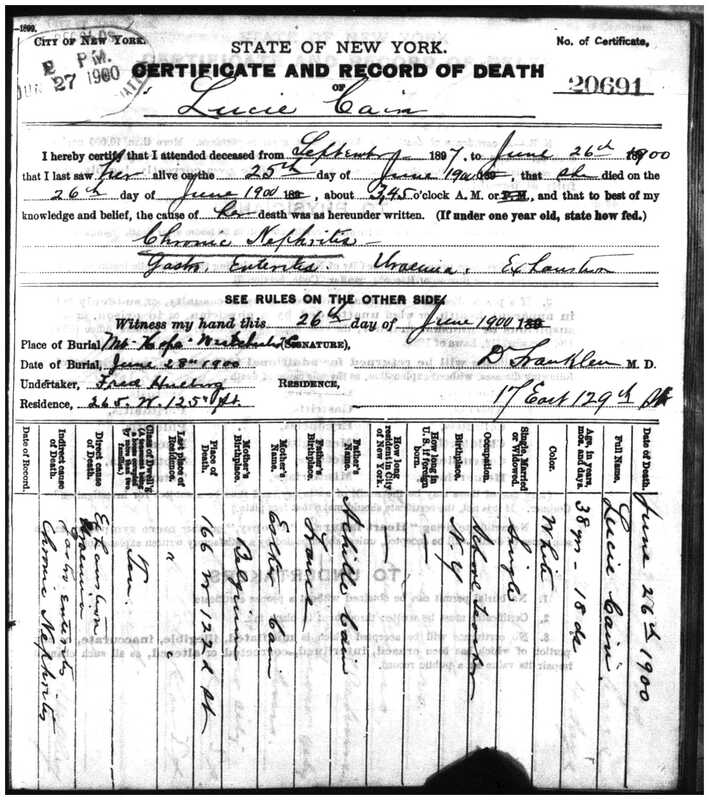 Lucie had died on June 26, 1900, just a few weeks after the 1900 census and less than a month after Harriet and George’s baby or babies were born. Had Harriet and George changed their baby’s name in memory of her aunt Lucie? I waited for Jim’s answer and also waited to receive electronic copies of the actual birth certificates for Edith and Lucie and of the death certificate for George’s sister Lucie. What I then learned seemed to confirm my theory—that the baby was named Edith at first, but then renamed Lucie after George’s sister died. 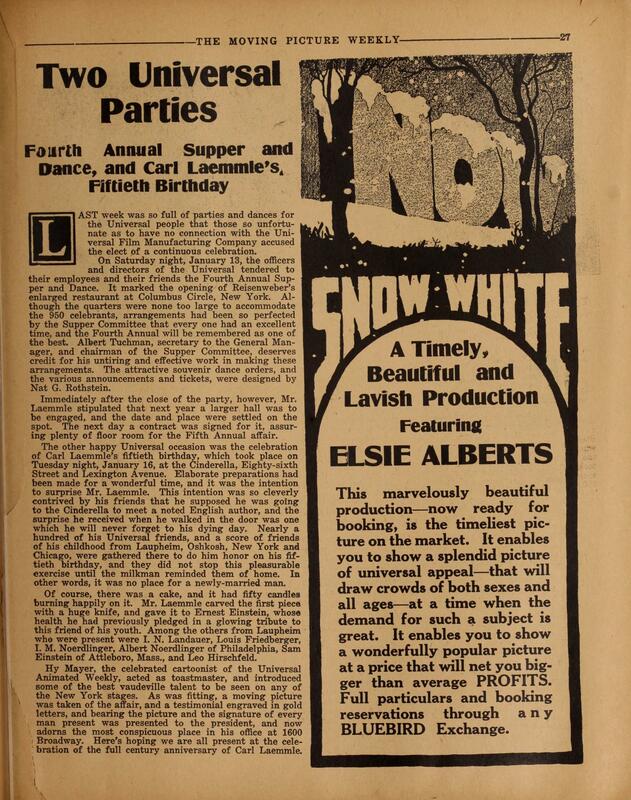 The first certificate for Edith was filed by the doctor on June 9, 1900; the second certificate with the name Lucie was filed by her mother Harriet on July 6, 1900. I also noticed that the second certificate had both the old address and new address on it with the old address as the place of birth. I was convinced that the baby born Edith was renamed Lucie after her aunt died. 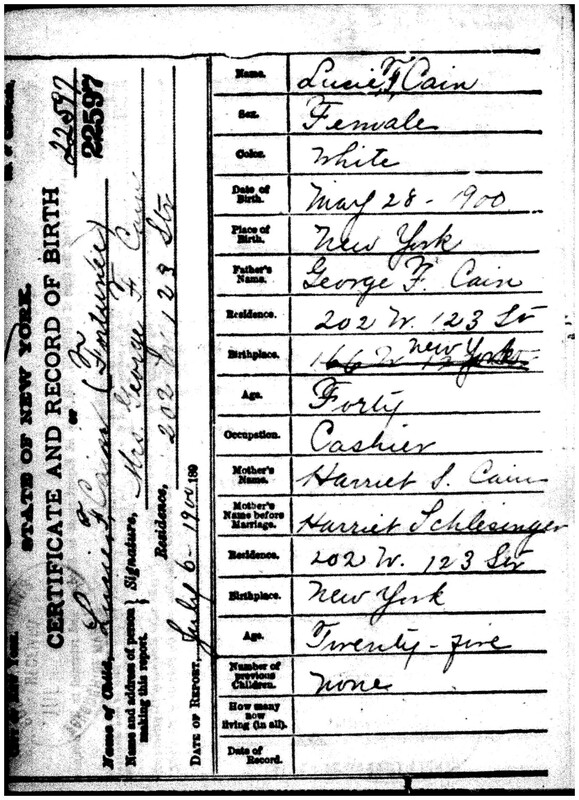 Somehow the city allowed Harriet to file the second certificate without rescinding the first one so two birth certificates are still on file 115 years later for one baby, born Edith, but then renamed Lucie. 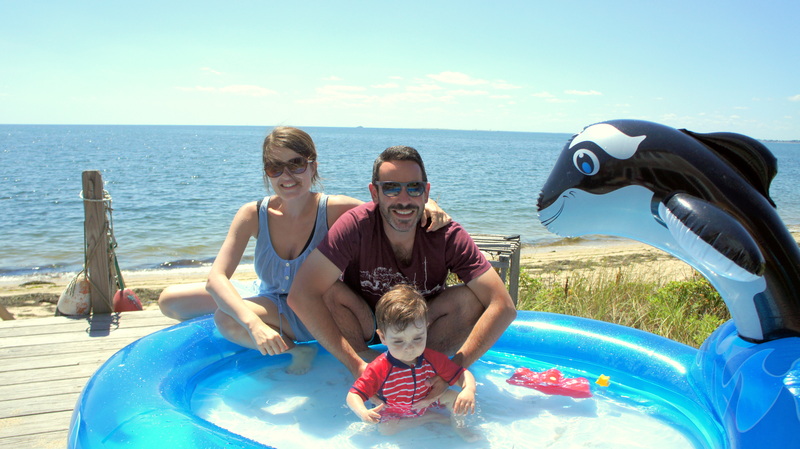 It must have been a time of such emotional turmoil for George and his family—the joy (and strain) of having a newborn baby mixed with the heartbreak of losing his sister at such a young age. Perhaps the bureaucrat at City Hall had acted out of sympathy, not carelessness, in allowing this second certificate to be filed. And by allowing the first to stay on file, the story of how George honored his sister was there to be discovered 115 years later. 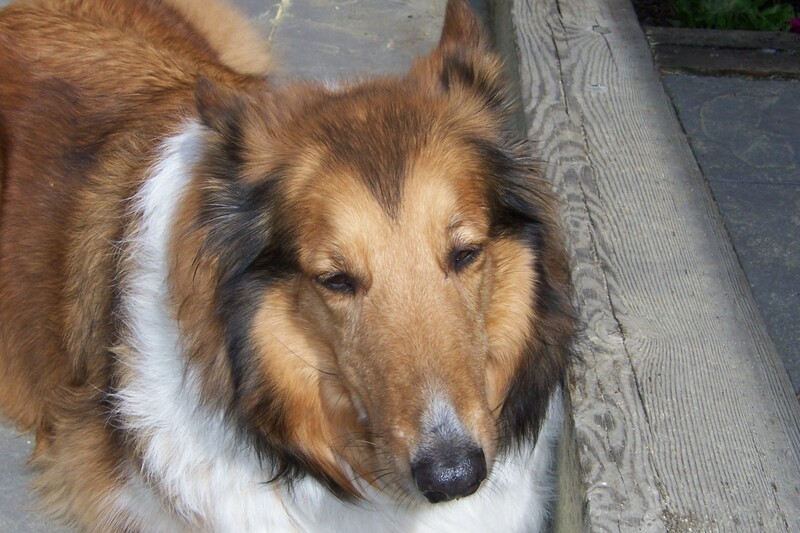 We said goodbye to our wonderful dog Cassie this week. It was a terribly hard and upsetting decision, but she was failing, and her quality of life had deteriorated to the point where we knew we had to make the right decision for her. We are at peace. She lived a good and long life for a dog. But we are also incredibly sad. Cassie was a pound puppy. 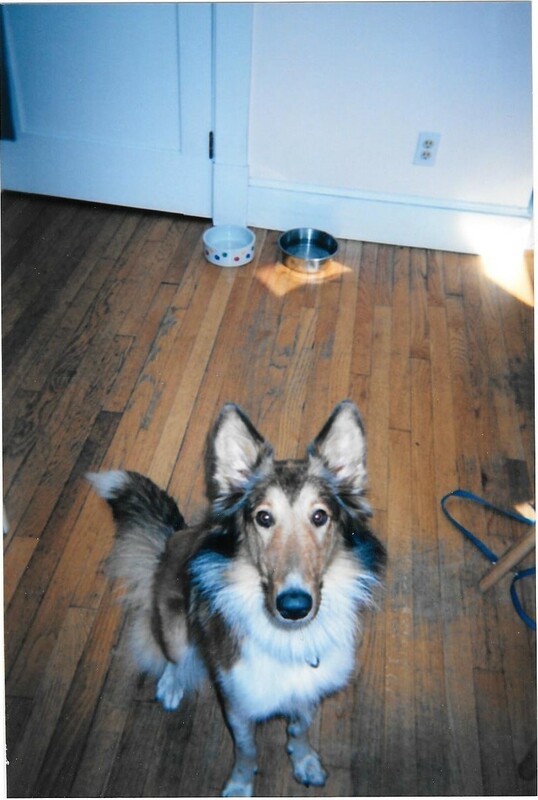 We got her at the Thomas J. O’Connor animal shelter in Springfield, Massachusetts, in the summer of 2001. The police had picked her up after finding her tied to a tree in a trailer park in Chicopee, and no one would claim her as theirs. She had been in the pound for only a few days when I saw her on Petfinders.com and suggested we go take a look. She was skinny, dirty, and overly excited. 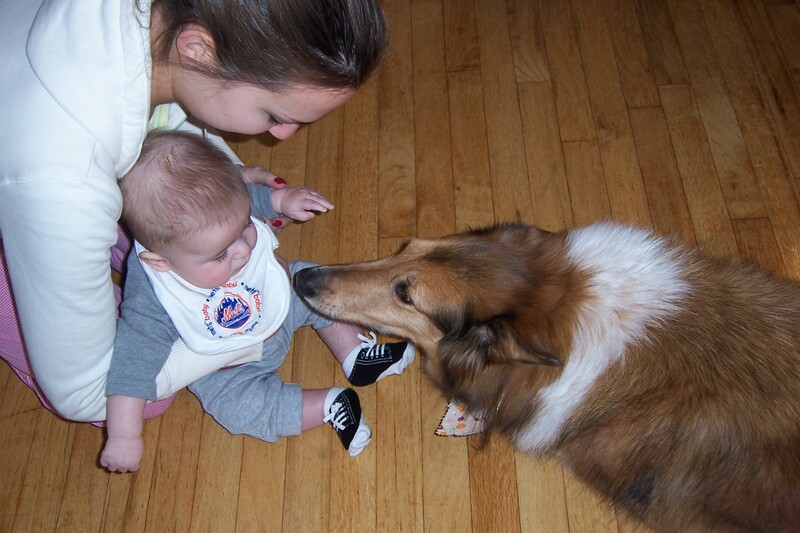 Harvey and Maddy were skeptical, but I was in love, and I knew right away that she was sweet and gentle and loving. And I was right. 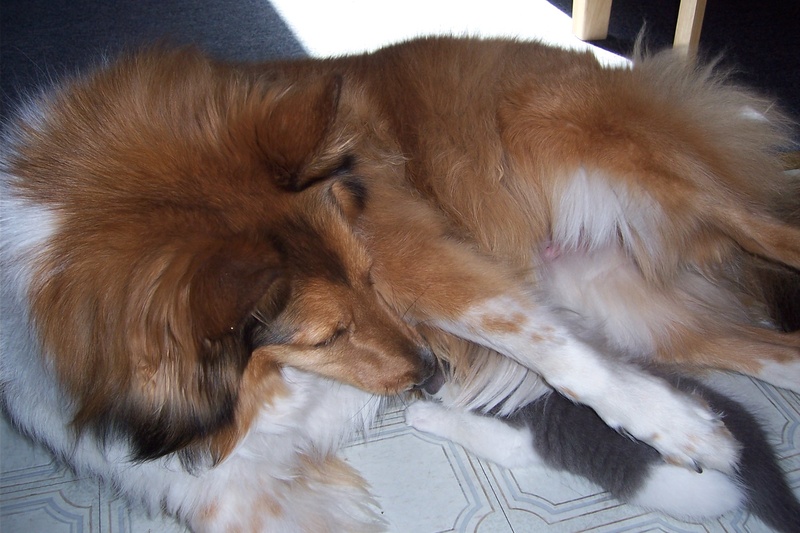 Cassie never once growled at a person or a cat, and she only growled at dogs if they invaded her space, which wasn’t very often. She never, ever hurt anyone. She loved everyone. When we told family and close friends that she was gone this week, everyone described her as loving and sweet and gentle. Our vet estimated that she was about a year old when we adopted her at the end of July, 2001, so we assigned her a birth date of July 31, 2000. She took almost no time to adapt to living with us. She was clean and playful and smart. She could run like the most graceful of animals. The first time we took her to the beach, she ran all the way up a high dune. We raced after her, fearful we’d never see her again, but there she was waiting for us at the top. It took a long time before she was ever let off the leash again. 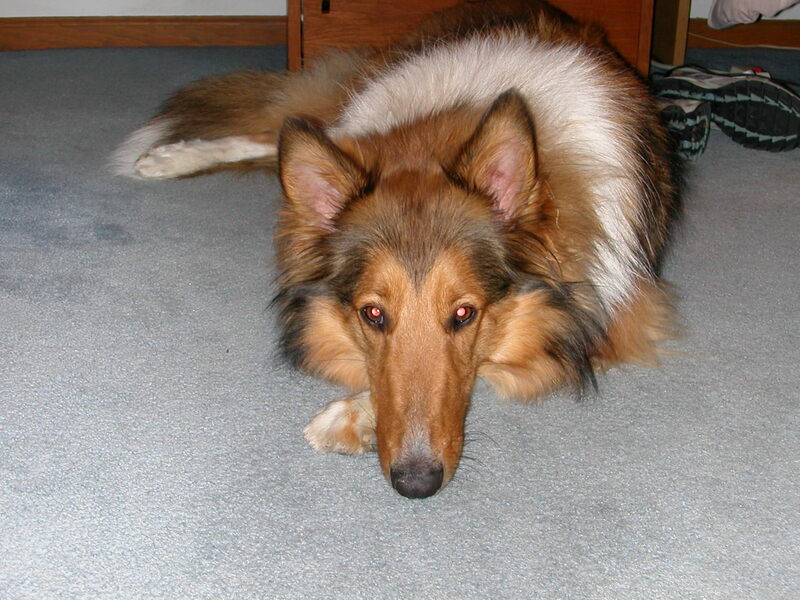 Cassie was with us during that dreadful fall of 2001 in the aftermath of 9/11. She was such a positive distraction. When my family, all shaken still by the events of that September, gathered for Thanksgiving, it was Cassie who made us laugh. She was still new and puppy-like, and she’d run from one member of the family to another, excited and happy. Once she settled in, she became calm and unflappable. 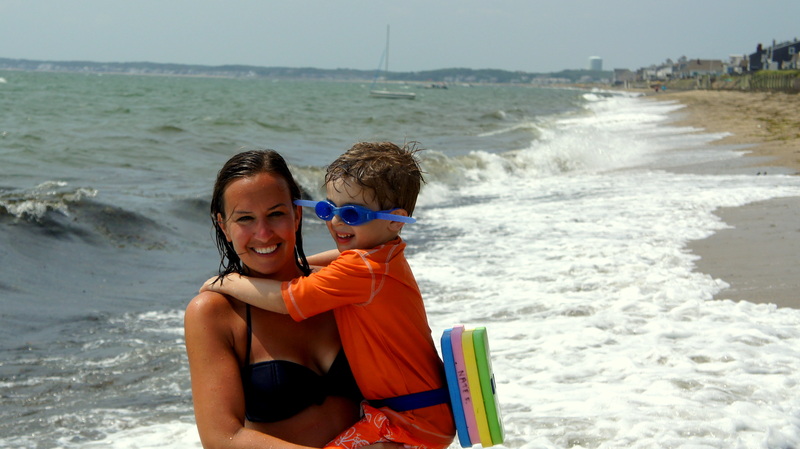 No matter where we took her—to the Cape, to a new house, to a temporary apartment before our new house was ready, to our cottage—she adapted almost instantly. 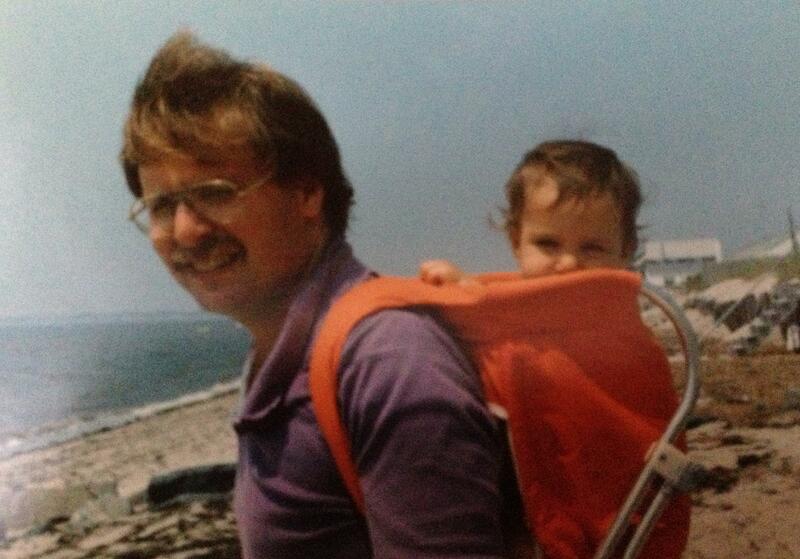 We even once dragged her all the way to Geneva, New York, so she could visit Maddy at college. She was great in the car, great with children, and great with us. I often felt badly that she was growing up in a home with no small children since she would get so excited any time she saw a young child. And children loved her. She would kiss them, and they would hug her. About the only thing she didn’t like were elevators. Can’t say that I blame her. She liked going to the groomer, she liked going to the vet. She liked strangers, she liked anyone. She didn’t bark at people at the door or those who entered our home. 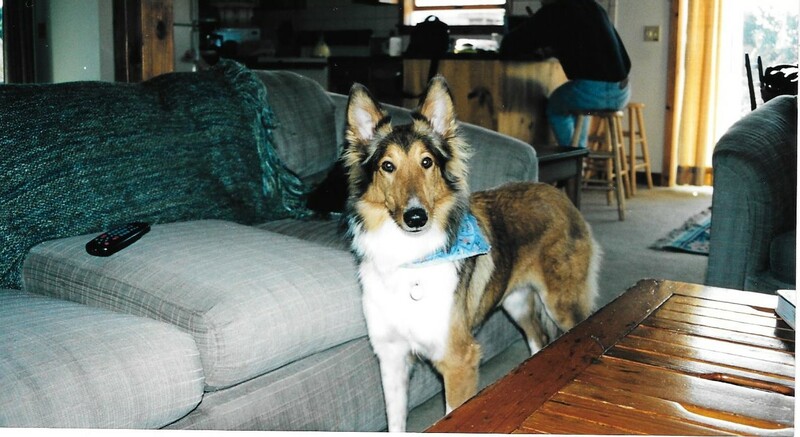 She never jumped on people or pushed them around, despite the collie herding instinct. She was definitely not a watchdog. She was a love dog. 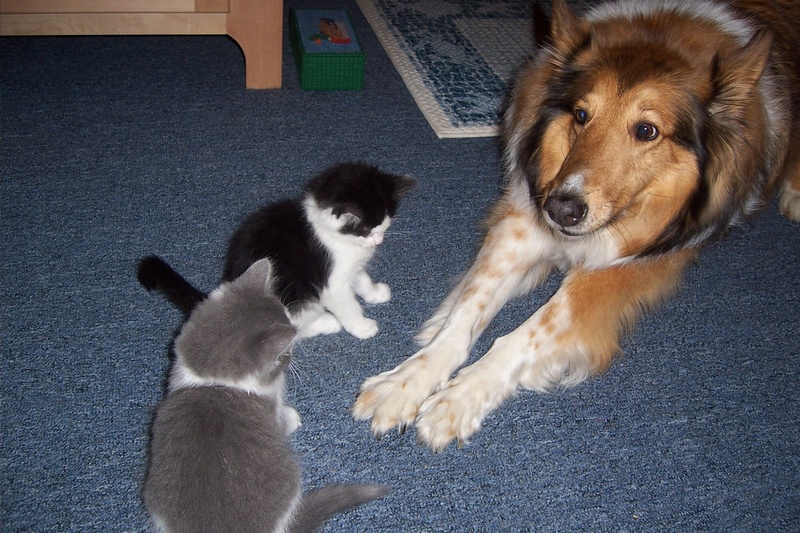 And our cats Smokey and Luna adored her. 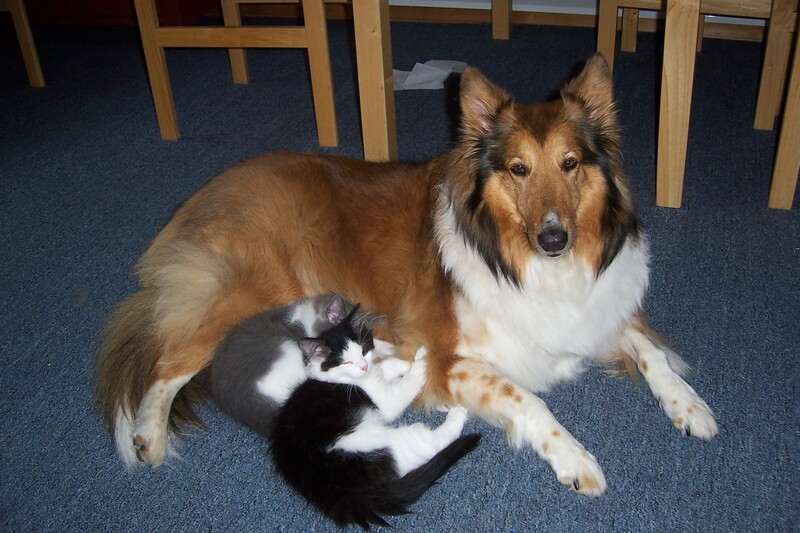 From when they were little kittens, they would curl up on her, and to the very end of her long life, Smokey still treated her like his mother, kneading his (clawless) front paws into her belly and nuzzling his nose into her fur. The only thing that seemed to light up Cassie’s eyes as she declined was Smokey. She would even chase after him a bit to play. 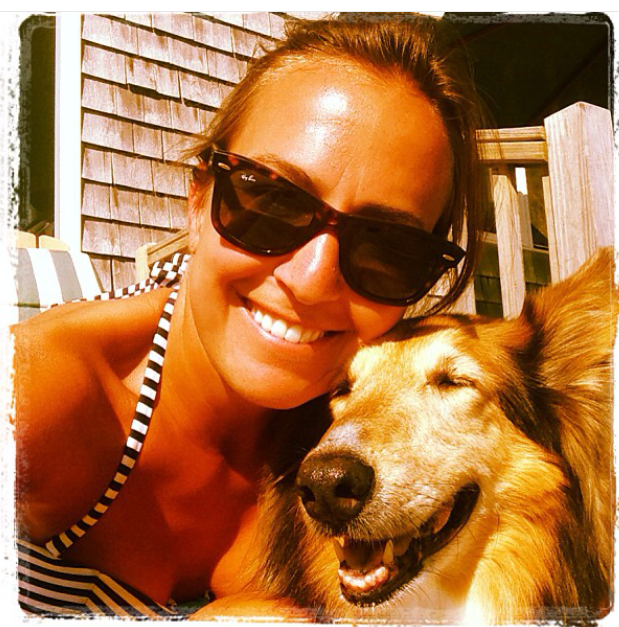 Cassie was an incredible companion—on long walks in the neighborhood or the woods or the beach (even though she didn’t love the beach much) and just being with us in our home. She was always right there with us wherever we went. I can’t tell you how much we will miss her and how much we agonized over her decline and our final decision to give her peace. But she had been there for us, and we had to be there for her. So we are at peace. 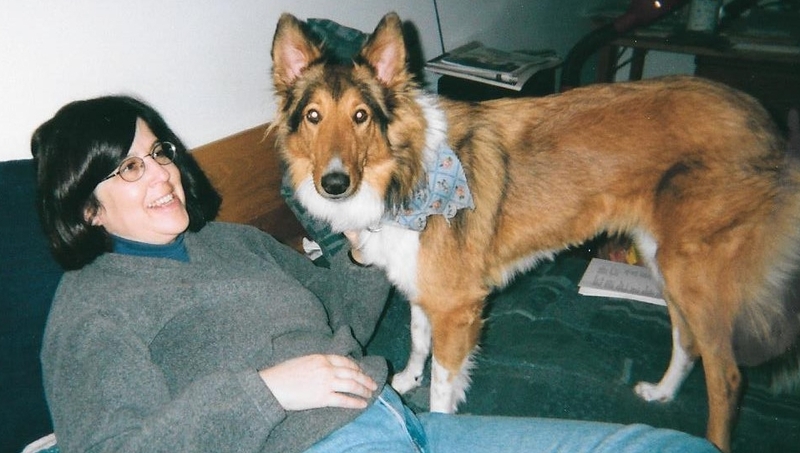 She is no longer distressed and confused, and we can look back with deep love and gratitude for the fourteen years we had her with us. Goodbye, Cassie. You will always be our dog, and we will always keep you in our hearts. 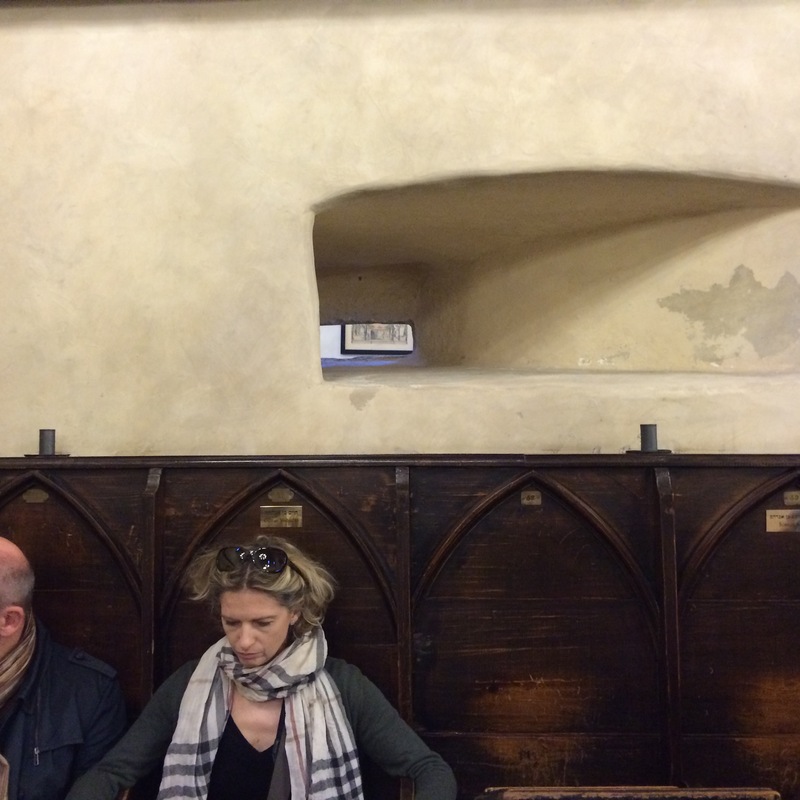 If our first day or so in Prague felt like a bit of a fairy tale, our second day had nothing magical about, just a lot of ghosts wherever we turned. 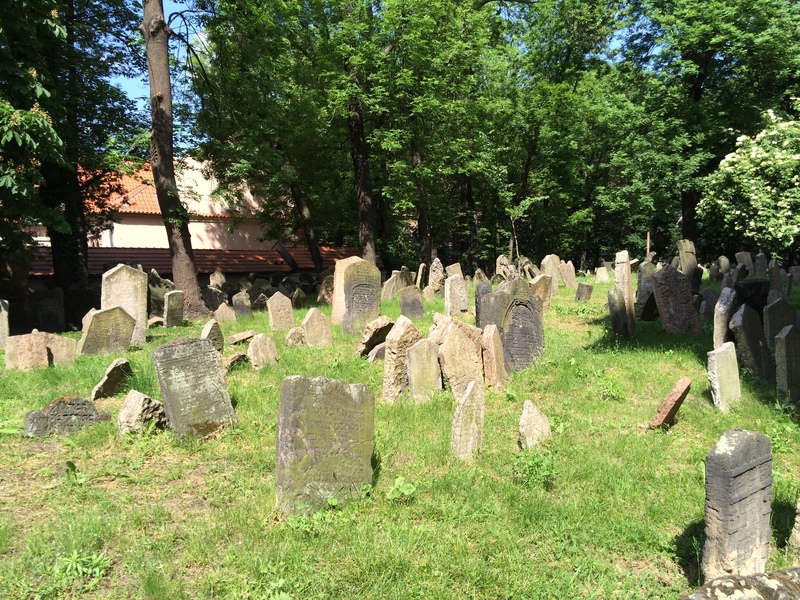 We had a new guide that day, Helena from Wittman Tours, a company that specializes in Jewish heritage tours of Prague and the surrounding area, including the concentration camp in Terezin. We had heard good things about the company from friends at home, so chose to use one of their guides for our second full day in Prague. Helena was another excellent guide, and she was able to provide us with another person’s perspective on Prague. Helena, like Andrea, was a Czech native and had lived in Prague for many years. When she told us that she was Jewish, I asked her about her family’s experience during the Holocaust. Helena said that although her parents had never discussed the matter in any detail with her, she knew that somehow they had been able to obtain falsified papers giving them a Christian identity. Like so many survivors, her parents preferred not to discuss those years, and thus Helena knew only those bare facts. 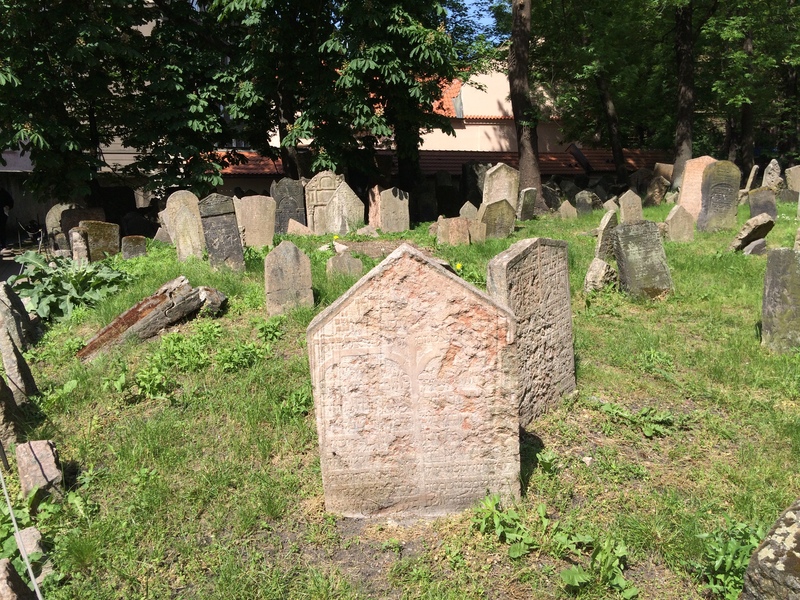 According to Helena, Prague had a Jewish community very early in its history, though many settlers came and left, depending on the economic and political situation. There was a Jewish community as early as the tenth century, living near the Castle and the marketplace there. Although that community was wiped out during the Crusades in the 12th century, there was then a new community growing on the other side of the river near what is now called Old Town, where in the 13th century the oldest still-existing synagogue was built, referred to as the Old-New Synagogue. That synagogue is still providing religious services to this day. It is claimed to be the oldest surviving synagogue in Europe. 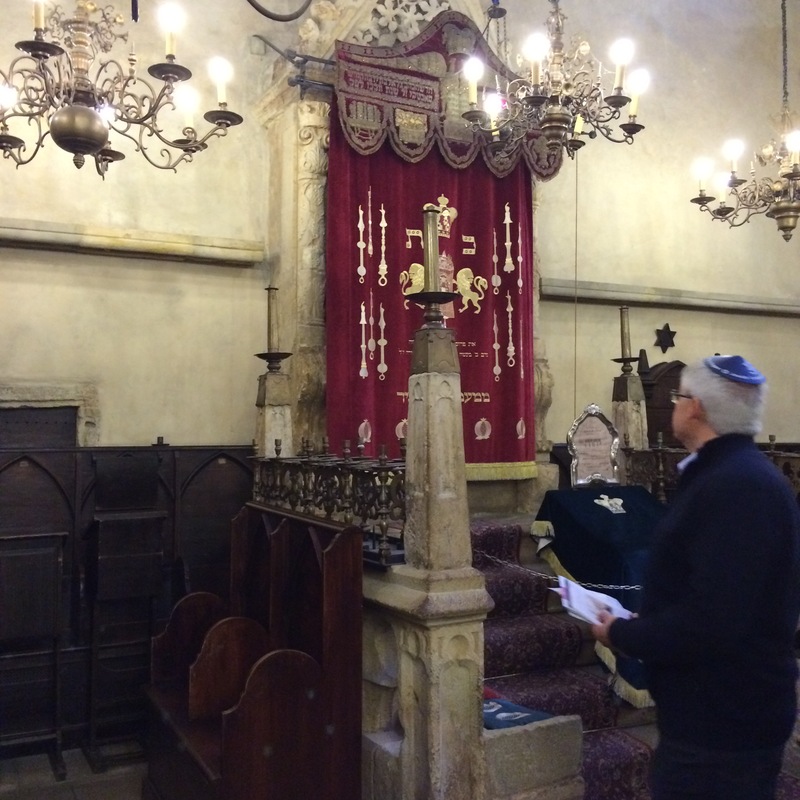 It was humbling to be in this synagogue, thinking of its long history. 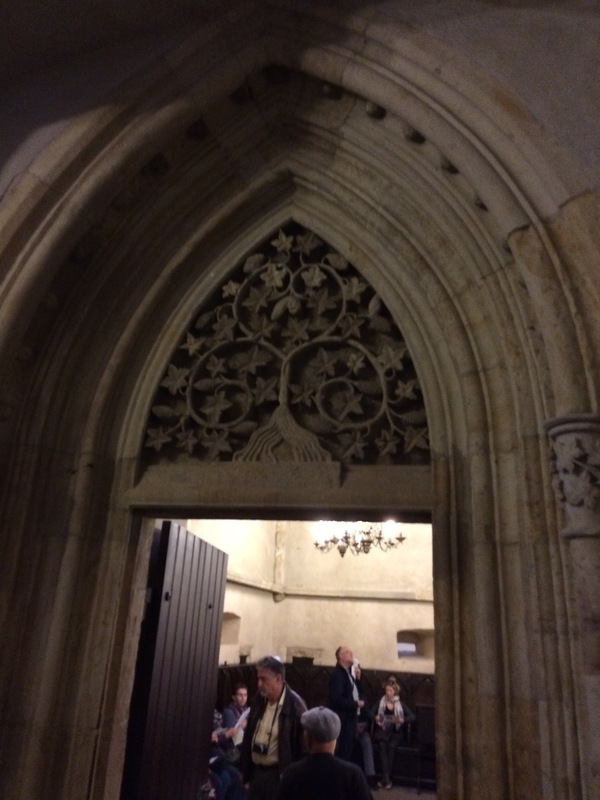 Although it lacked the awesome size and height of the St. Vitus Cathedral and of some of the other synagogues we saw in the Jewish Quarter of Prague, it was moving to think about Jewish men (women prayed behind a thick stone wall with only a small hole to see into the main sanctuary) almost 800 years ago praying in this space. Jews then lived in a ghetto, separated from the rest of the city by walls, and they faced anti-Semitism and periods of expulsion and then return, but were generally successful merchants and bankers and important contributors to the economy of the city. 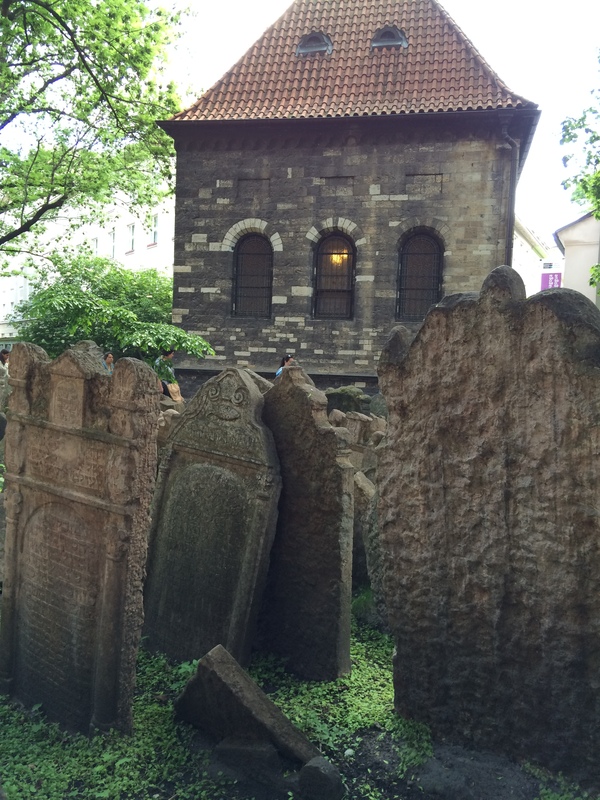 The second oldest of the synagogues we saw in Prague was the Pinkas Synagogue, built in the early part of the 16th century. Today it operates as a museum to educate people about the Jewish religion, its holidays and rituals, and does not operate as a place of religious services. 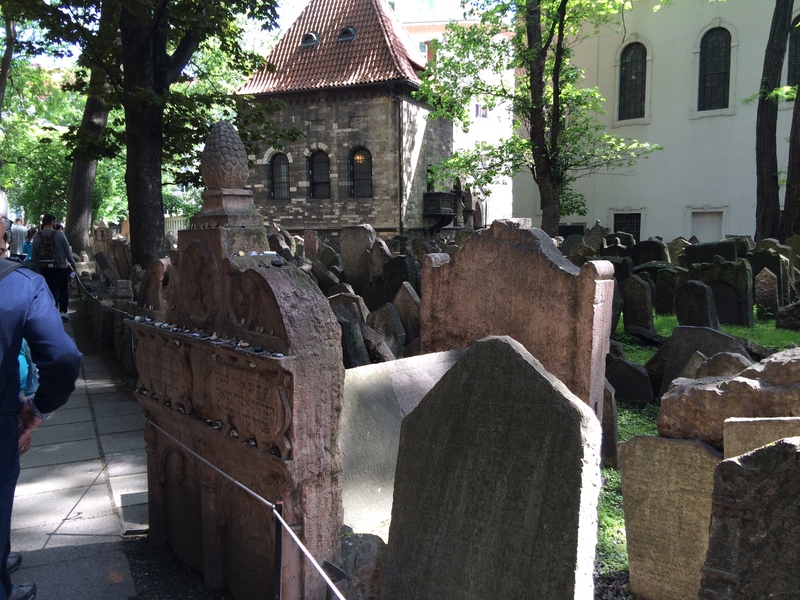 Immediately outside the synagogue is the oldest Jewish cemetery in Prague, so crowded with the remains of about 200,000 Jewish residents that the headstones are tumbled together and, according to Helena, are buried as many as twelve deep, one on top of the other. 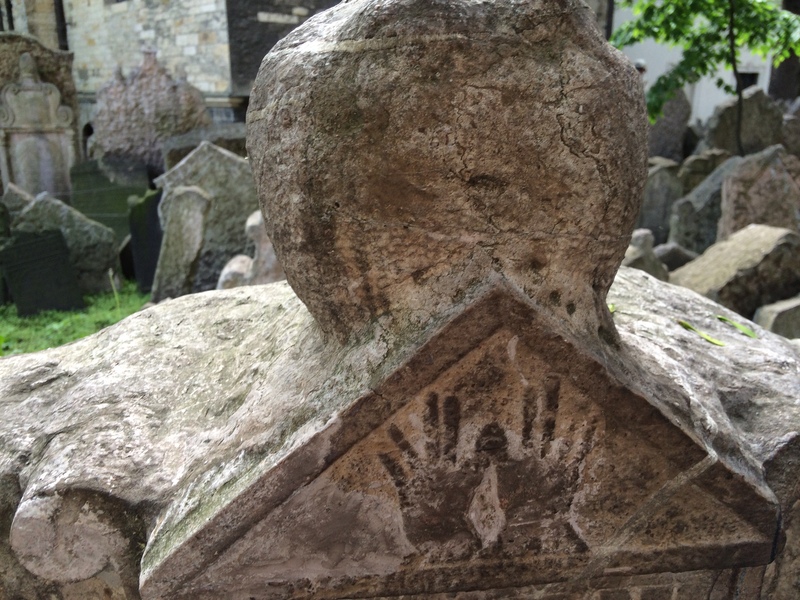 These ancient stones and their placement and inscriptions are evidence of what once was a crowded Jewish neighborhood within the ghetto walls, a community that was observant of Jewish laws and forced to live separately from their Christian neighbors. 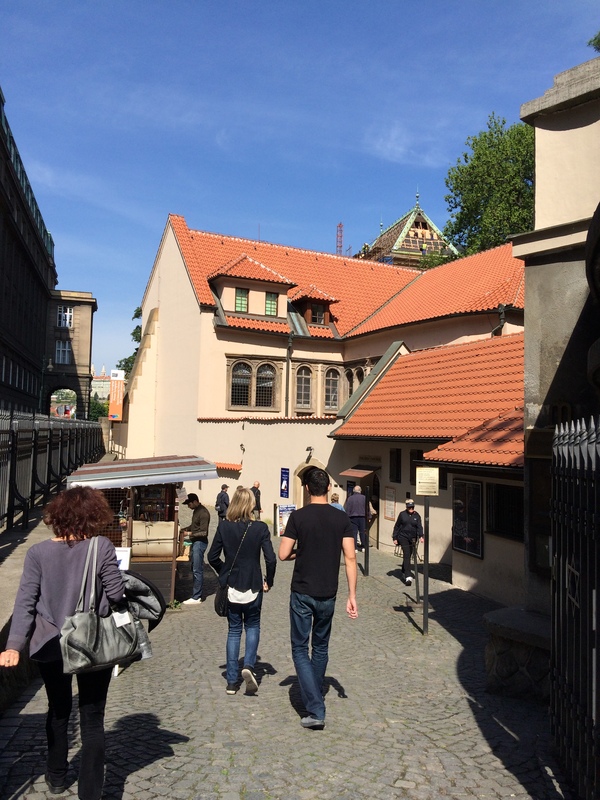 In the 1500s Prague had one of the largest Jewish populations in Europe. 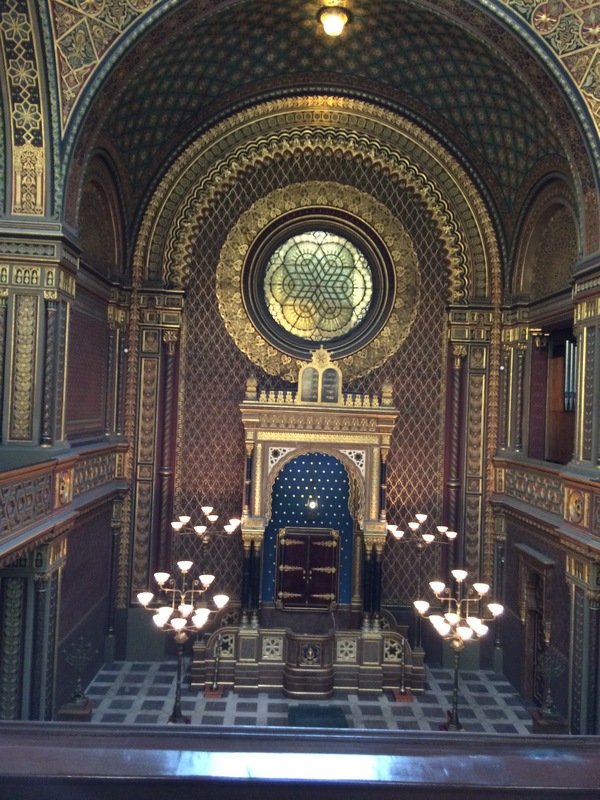 Other synagogues were built, including a synagogue built by one of the wealthiest residents of Prague, Mordecai Maisel, as his own private synagogue. According to Helena, Maisel was friendly with the reigning king, Rudolf II, and was an important merchant and property owner in Prague. Maisel was also very friendly with Rabbi Judah Loew, a leading rabbi as well as a writer, best known for his rendition of the Golem legend. 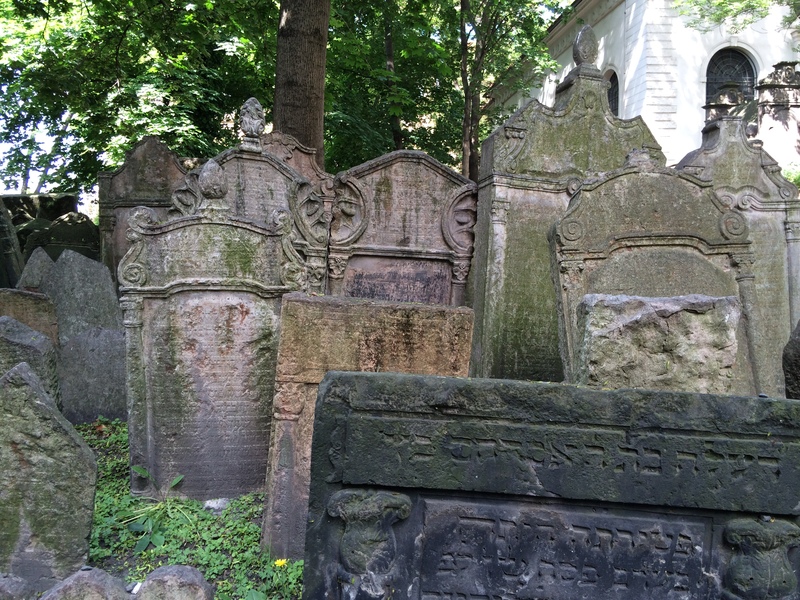 Both Maisel and Rabbi Loew are buried in the Old Cemetery, their graves marked by large tent-like structures instead of plain headstones. 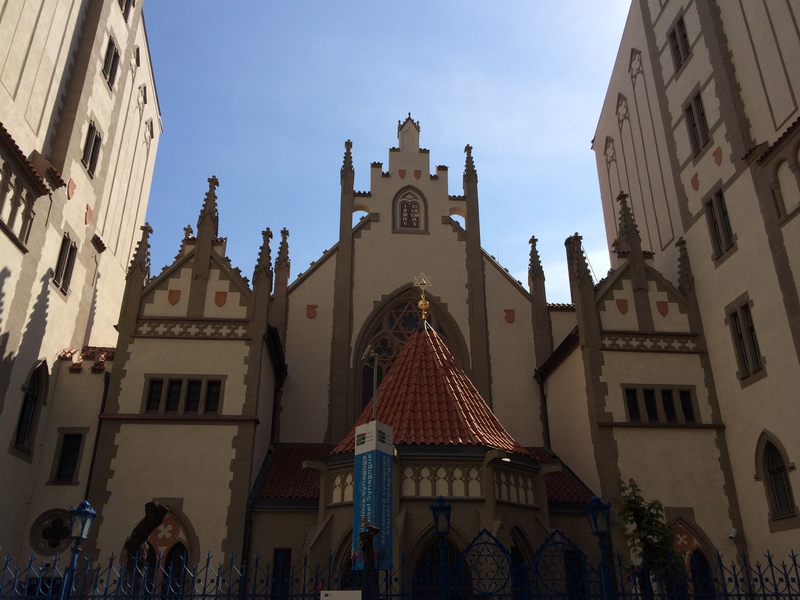 We were not able to get inside the Maisel synagogue as it is closed for renovations, but we were able to take some photographs of the exterior. 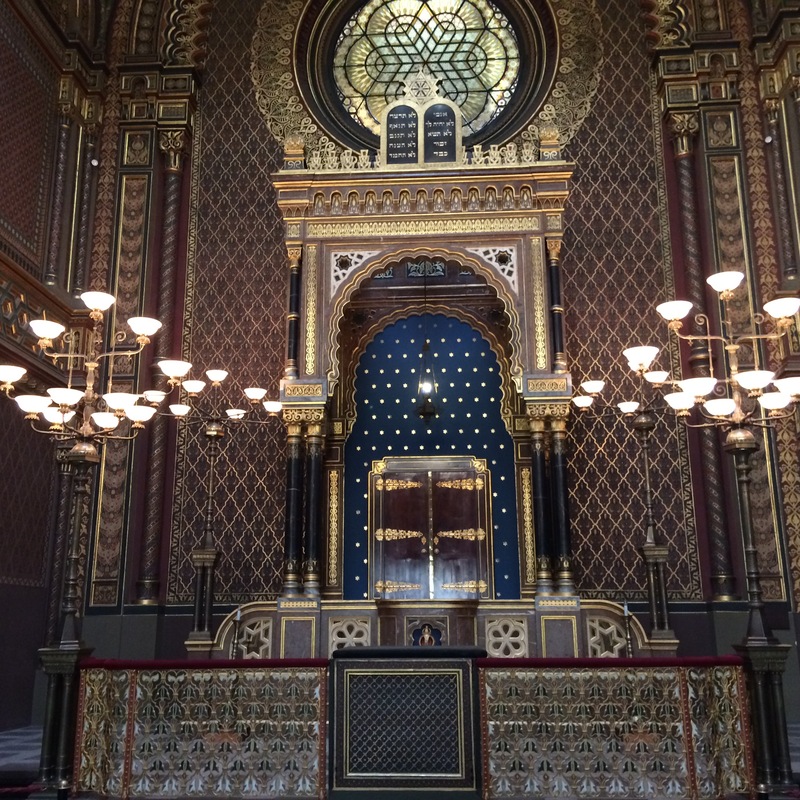 The newest synagogue we saw in the Jewish Quarter was the magnificent Spanish Synagogue. Despite its name, the synagogue had nothing to do with Spain nor were its congregants Sephardic. 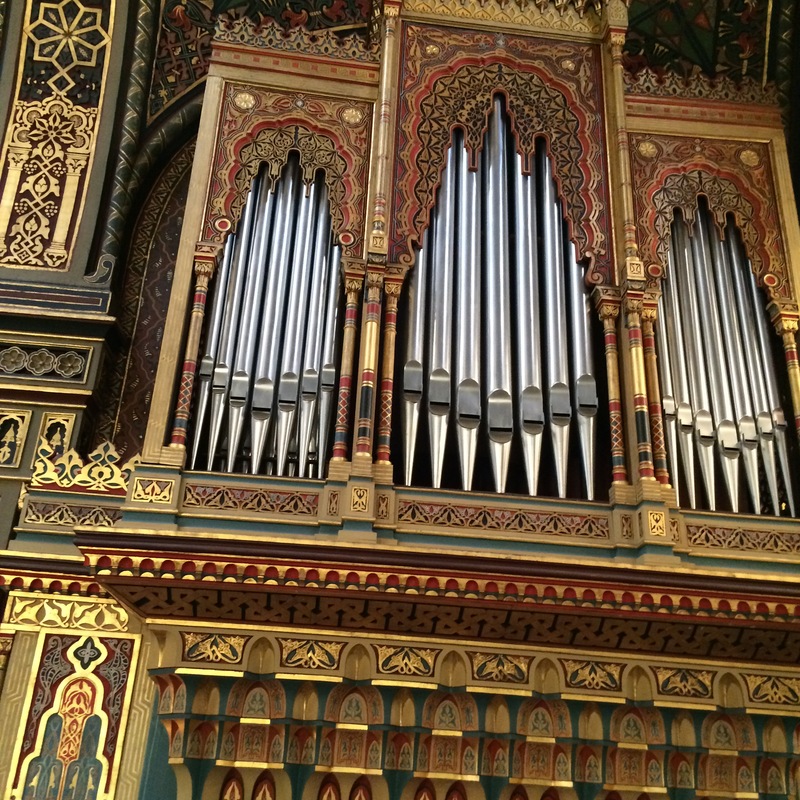 Rather the name refers to the Moorish designs that decorate both the exterior and the interior of the synagogue. 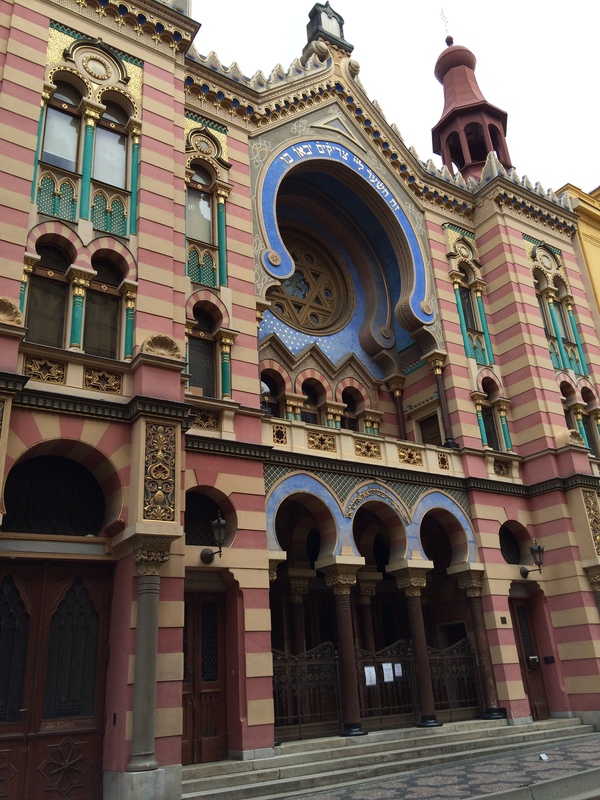 This synagogue was built in the second half of the 19th century and still offers services on Friday nights, attracting many tourists. 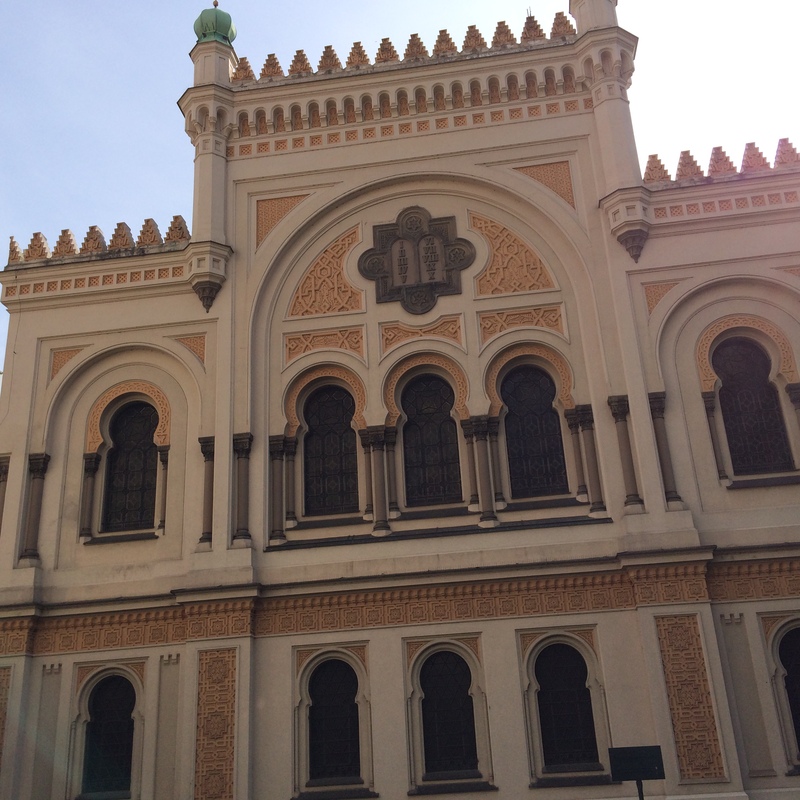 Seeing this synagogue made me realize just how prosperous the Jewish community must have been in the 19th century. 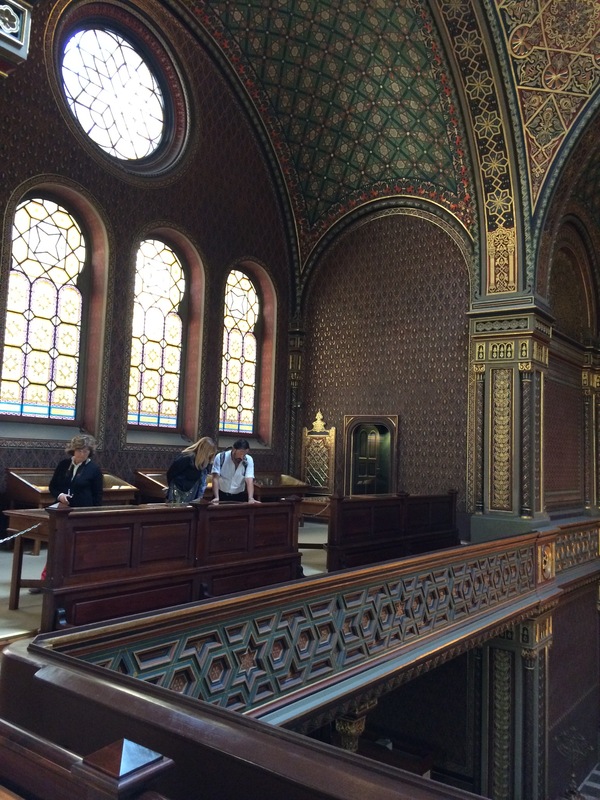 The lavish and ornate wall coverings are indicative of the resources available to the Jewish residents. In fact, Jews were granted equal rights around this time, and the ghetto walls came down, allowing Jews to move out of the Jewish Quarter. Many moved to the New Town area, where yet another impressive synagogue was built in the early 20th century, the Jerusalem Synagogue. 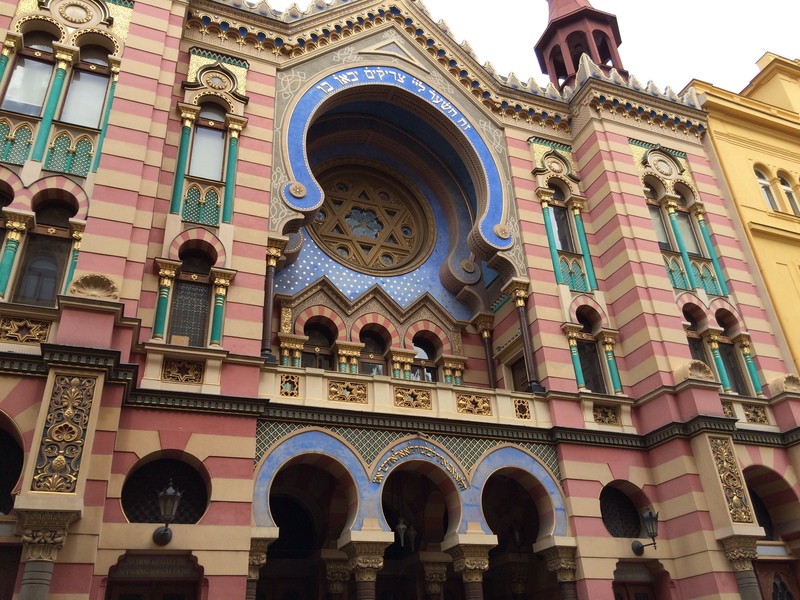 We later visited this synagogue on our own, and although we did not get inside, we were once again dazzled by the colorful and elaborately designed exterior, which also reflects Moorish influence. Helena told us that once the Jews were allowed to move out of the ghetto, most left if they could afford to do so, leaving behind only those too poor to move. 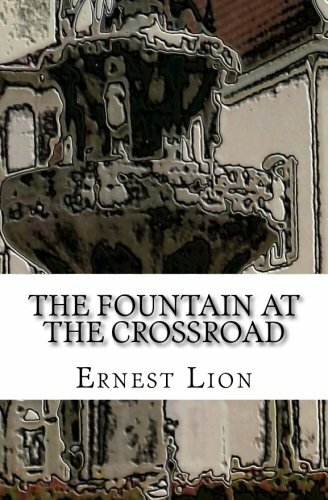 Poor Christians then moved into the area where the ghetto had existed, and because of the poverty, conditions deteriorated, leading to severe sanitary and health problems. 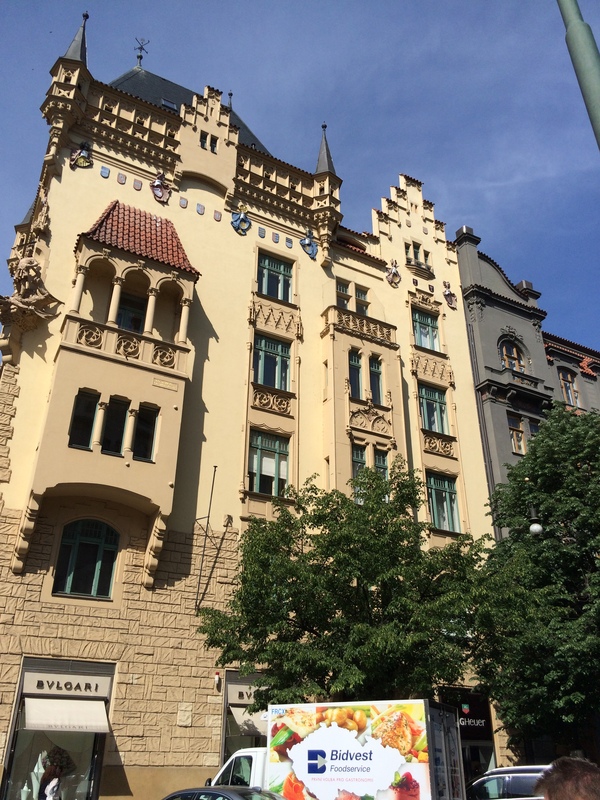 Eventually the city tore down the old buildings in an early form of urban renewal, replacing the older homes with the fancy Art Nouveau buildings that line the streets today. The streets were widened, and the whole character of the former ghetto disappeared. For the most part, only the synagogues survived. Then the Nazis arrived in the late 1930s and 1940s, and what had been a large and thriving Jewish community of over 90,000 people, amounting to about 20% of the city’s overall population, was destroyed. 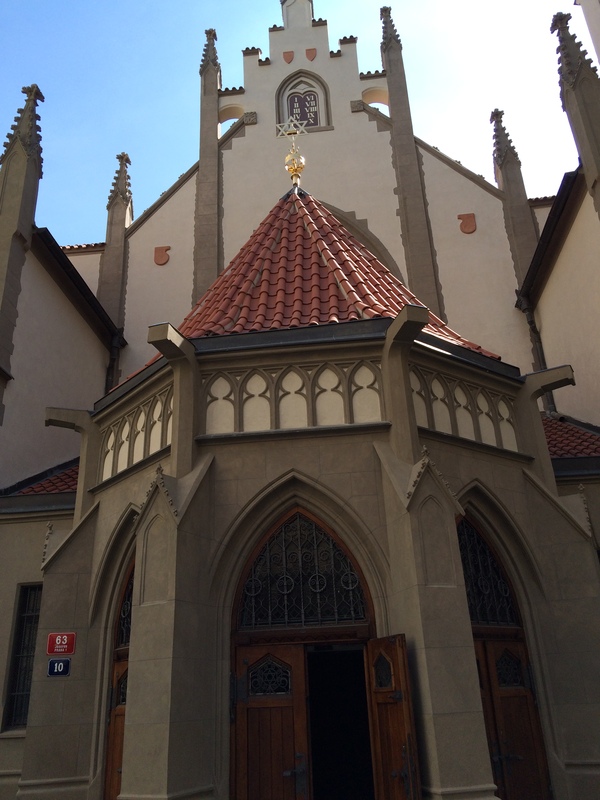 The synagogue buildings survived only because the Nazis found them useful for storing their supplies and horses. 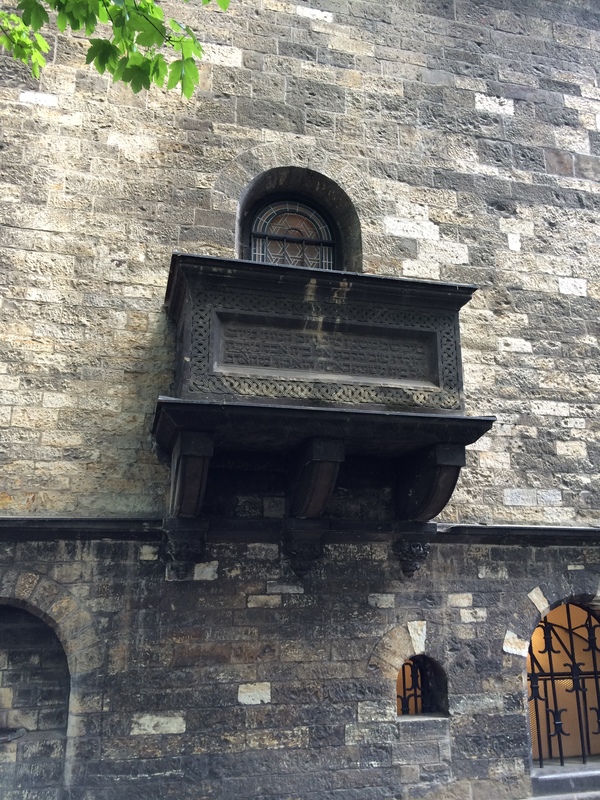 Most of the Jews who had lived in Prague were killed. 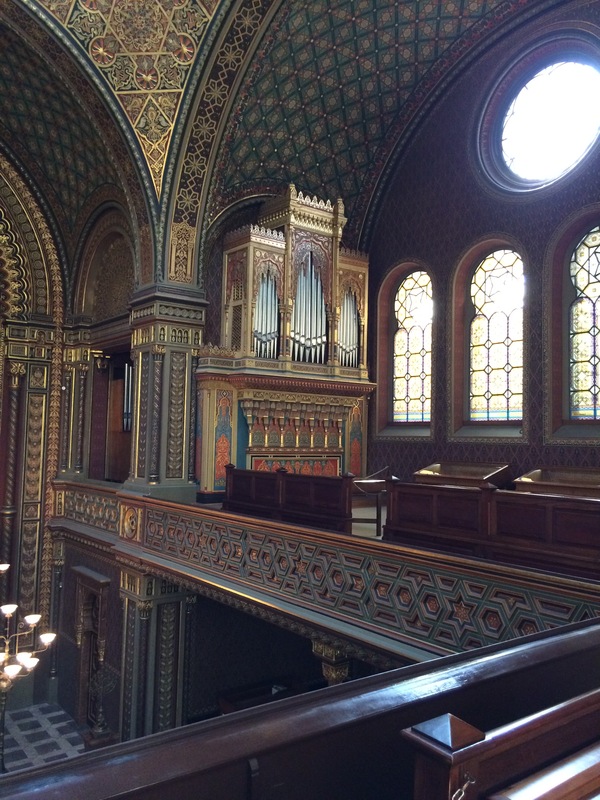 Today there are fewer than 2000 Jews living in Prague. Seeing the Jewish Quarter and learning about its history helped place into context what we saw in the afternoon when we went to Terezin. 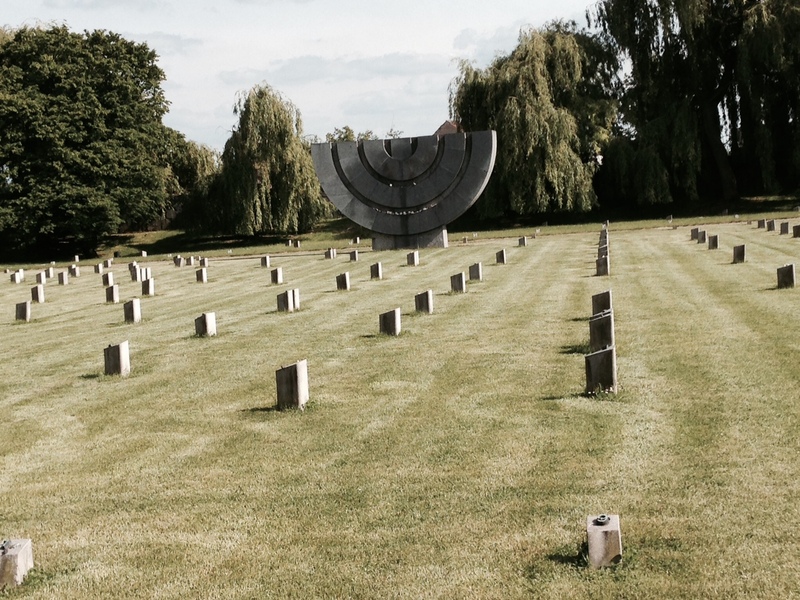 As we drove to Terezin, Helena told us about the assassination of Reinhard Heydrich, the SS officer who is considered to have been one of the principal planners of the Final Solution, the Nazi plan for exterminating the world’s Jewish population. He also was appointed as the SS officer responsible for overseeing the occupation of Czechoslovakia during the war and the creation of the Terezin concentration camp. 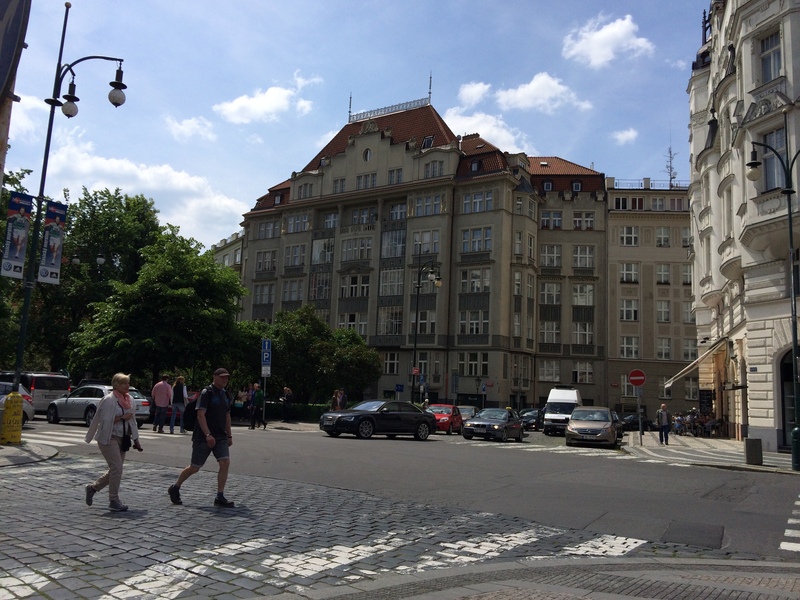 In May, 1942, two Czech resistance members attacked Heydrich’s car and assassinated him. As revenge, the Nazis selected the town of Lidice, claiming it was the home of the assassins, and completed erased it from the face of the earth, killing all the men, deporting all the women and children, and razing all the buildings. As Helena said, when people learned what had happened, they thought it could not get any worse. But as we now know, it got much worse. I am not sure how to write about Terezin. I wanted to go there to pay my respects to the numerous Seligmann cousins who had died there as well as all the other thousands who had died there. But part of the time I felt very uncomfortable, like I was visiting a museum, not a place where people were tortured, starved, and killed. I took a few photographs at first and then stopped because I felt it to be disrespectful and trivializing to take pictures as if I were visiting an ordinary tourist attraction. The last photo I took was one of a cell in the Small Fortress, the part of Terezin where dissidents and “criminals” were sent to be punished as opposed to the Large Fortress where the Jews were sent to await their deaths. Of course, many Jews were also classified as dissidents and “criminals” and ended up at the Small Fortress, and the room I photographed was one where such Jewish prisoners were sent, getting no meat and just water and a piece of bread twice a day and sleeping like animals on platforms squeezed into a tiny space where they were crowded on top of each other. The solitary confinement cells, the yard where guards shot Jews for target practice, the sinks where no water ran but were there merely to fool the International Red Cross. My brain had a hard time absorbing that these were real places where these horrendous things actually happened. My initial impression of the so-called Large Fortress or ghetto was that, by contrast to the Small Fortress, it was not that bad. This was the camp that Hitler used as a “model camp” to convince the International Red Cross that Jews were being well-treated. Children put on performances and created drawings and played soccer, all to impress the visitors. Food was served for the visit that was never served again. Children were required to lie to the visitors to create the impression that they were happy. Some of the children’s drawings are on display at Terezin, and they are just heart-breaking. The childlike depictions of their happy lives before the war and of their impressions of what was happening around them are so powerful. I can’t possibly convey in words what these drawings convey. Although Terezin was not a death camp, many thousands of people died at Terezin either from malnutrition, disease, or murder. 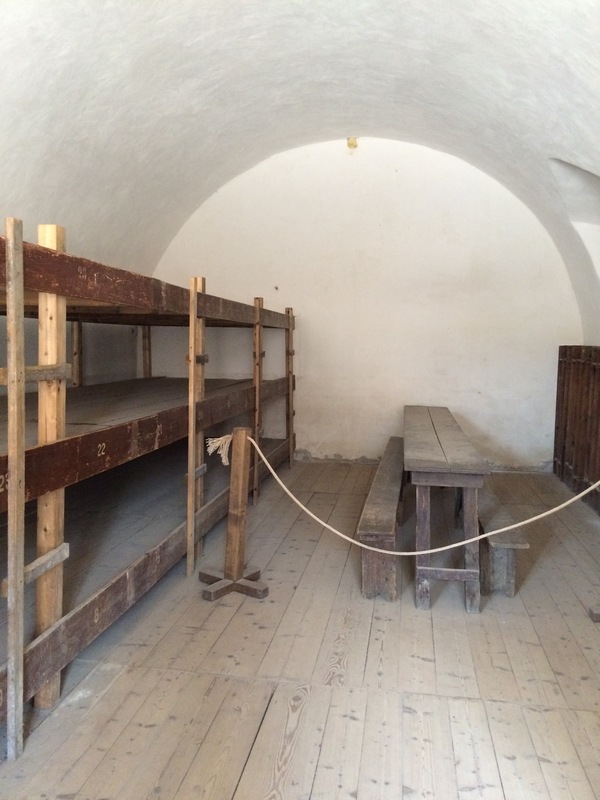 When we saw the barracks where people lived and the living conditions they endured, my initial impressions were corrected, and I realized how horrible life must have been for those forced to live there while awaiting death, either at Terezin or later when shipped to Auschwitz. As I noted above, according to records at Yad Vashem several of my Seligmann cousins died at Terezin, including Moritz Seligmann, Laura Seligmann Winter, Bettina Seligmann Arnfeld, Anna Seligmann Goldmann and her husband Hugo and their three children Ruth, Heinz, and Gretel, and Eugen Seligmann. Helena was able to catch a researcher at Terezin right before he was leaving for the day, and in a few minutes he was able to provide me with information about one of these relatives, Eugen Seligmann. He gave me these documents. 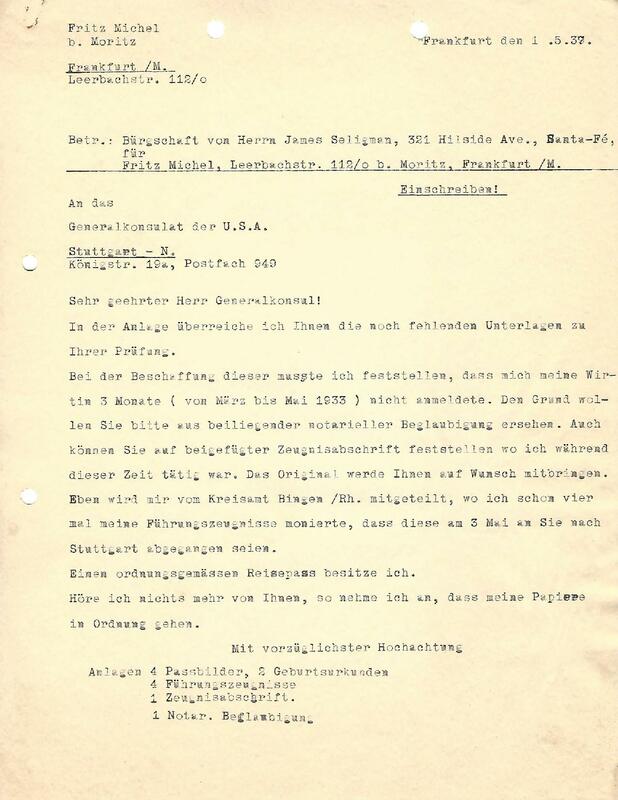 From these documents we were able to learn the day Eugen died and from that we were able to identify where in the burial grounds at Terezin Eugen had been buried. You see, the bodies were buried in mass graves that were identifiable only by date. 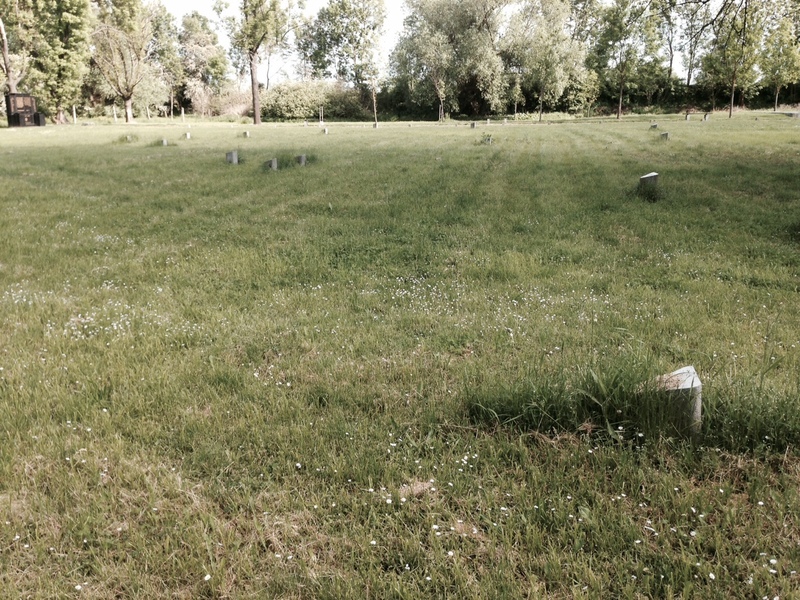 Eugen died on September 16, 1942, and thus the archivist at Terezin could determine that he had been buried in a mass grave located at marker 59. Helena led us to the cemetery where the markers are posted, and after some searching (many markers had numbers missing for reasons that were not clear) we found marker 59. I placed a stone on the marker and stood in silence, thinking about this cousin I’d never known and what his life and his death at Terezin must have been like. According to the death certificate, Eugen died from marasmus, or severe malnutrition. In other words, this 87 year old man starved to death. 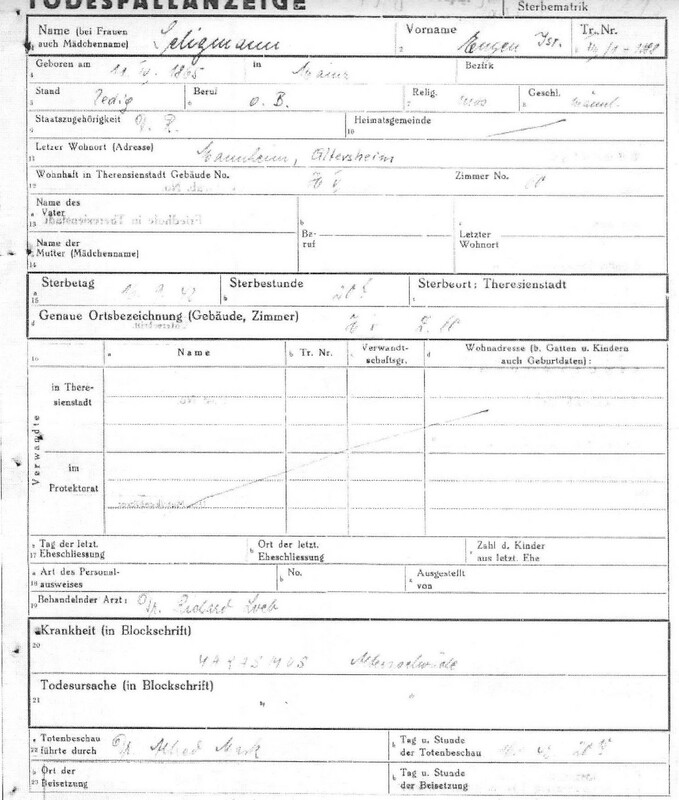 It is just horrifying to look at this document and translate the German words; the document records his birth date, his home town, his date, day, and time of death, his parents’ names and whether he was married and had children (none recorded here), the name of the attending physician, and other information—the level of detail is in direct conflict with the dehumanization the Nazis inflicted on these people. Why create a record that creates an impression that someone cared who this man was and then toss his body into a mass grave? Eugen, the son of Carolina and Siegfried Seligmann and a nephew of my great-great-grandfather Bernard Seligman, was a member of a successful Jewish German family. He was in his late 80s when he was taken to Terezin. How can anyone possibly grasp what it must have been like for him to have been torn from his home and transported to this camp in Czechoslovakia, deprived of all his rights and property, forced to live in squalor and without any privacy or essentials? How can we grasp what it must have been like for this elderly man to starve to death in such a place? How can anyone understand how human beings can do this to other human beings? I never knew Eugen or any of the other cousins who died at Terezin. In fact, a year ago I didn’t know I had any cousins who died in the Holocaust. Although going to Terezin was a very painful and nightmarish experience, I am glad that I was able to honor their memories by visiting the place where they are buried, the place where they were killed for no reason at all. Even now I cannot really fathom what happened there. It just is incomprehensible. 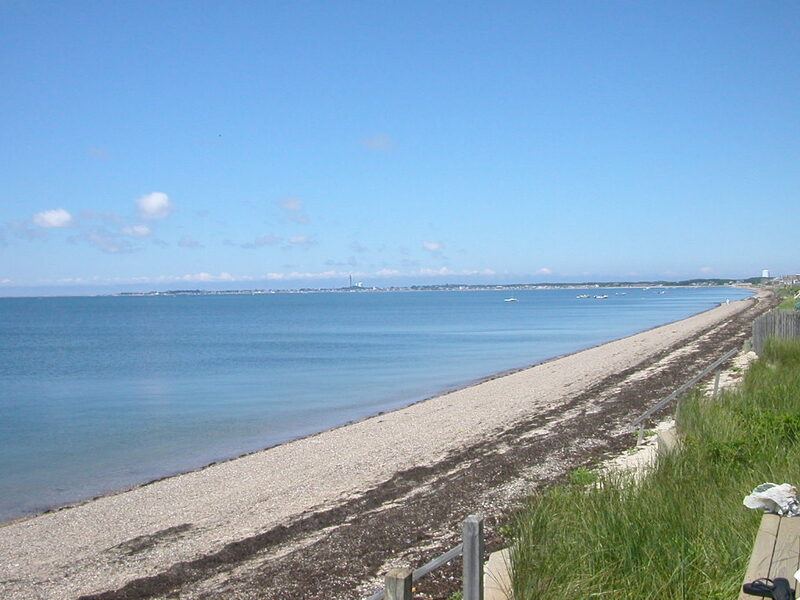 One thing I have been trying to do as part of my preparations for our visit to Tarnobrzeg and the surrounding towns is a last ditch effort to find some other clues as to where my Brotman ancestors lived. 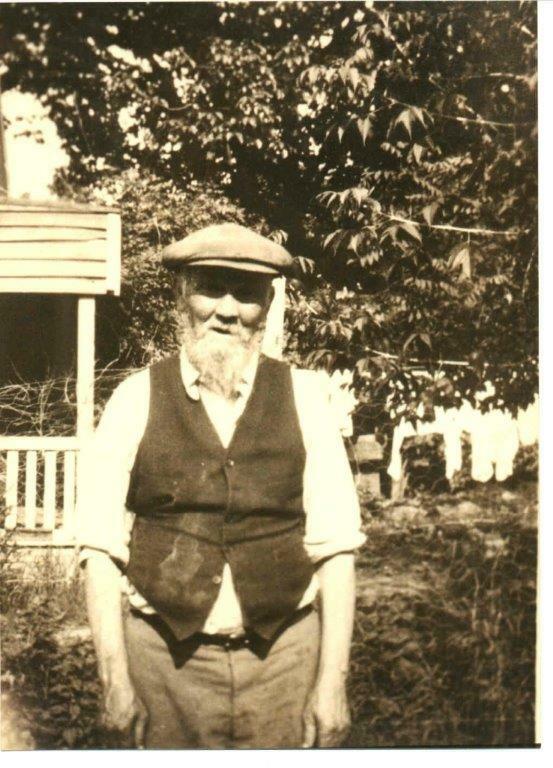 I have gone back through the research I’ve done on my great-grandparents and their Galician born children, Abraham, Max, David, Hyman, and Tillie, and have found no new clues. 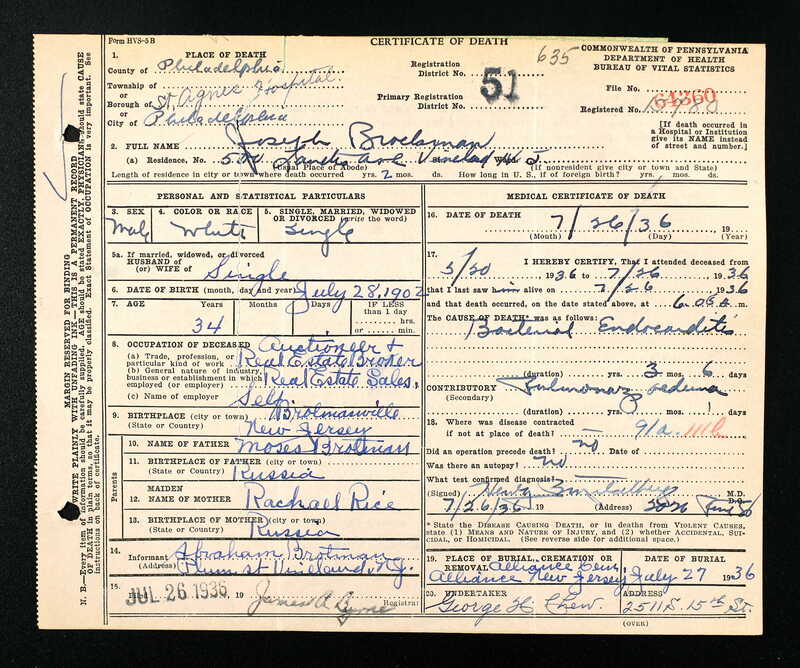 Then I realized that now that I have some DNA confirmation that my great-grandfather Joseph was the brother of Moses Brotman of Brotmanville, I needed to go through their records as well to see if I could find some new clues. I had done an initial search a few years ago, but had not yet gone back and checked it more thoroughly. What I already knew was that Moses Brotman had had many children, some born in Europe, some born in the US. His oldest (known) child was his son Abraham, who was born in Europe. Abraham Brotman had originally settled in New York City and established a cloak factory there, but was invited by those who created the Alliance Colony in Pittsgrove Township, New Jersey, to start a factory there to employ the residents when the farming season ended. Eventually, a section of Pittsgrove was named Brotmanville in his honor. What I knew from the descendants and from my earlier research was that Moses had been married twice and Abraham had been the child of his first marriage. 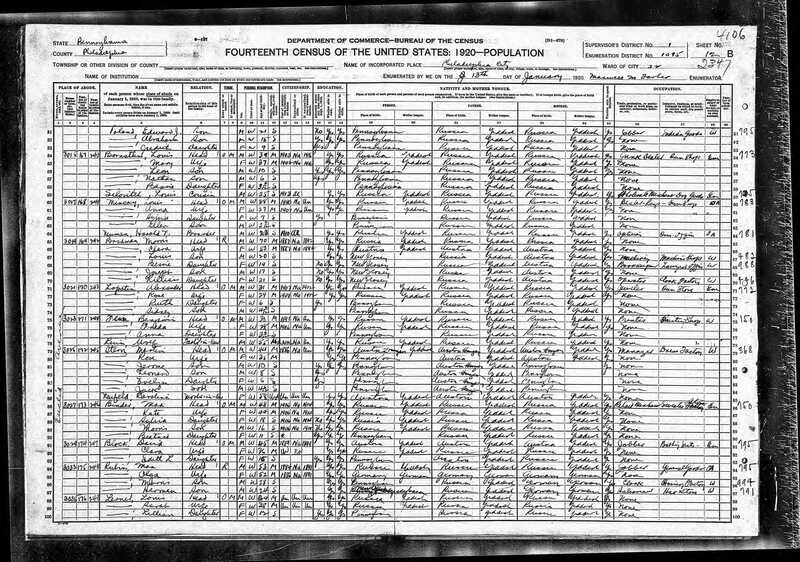 Although the census records for Abraham are in conflict about his birthdate, the earliest to include his age, the 1900 census, reported his birthdate to be November 1863, long before Moses married Ida, the woman with whom he immigrated to America. 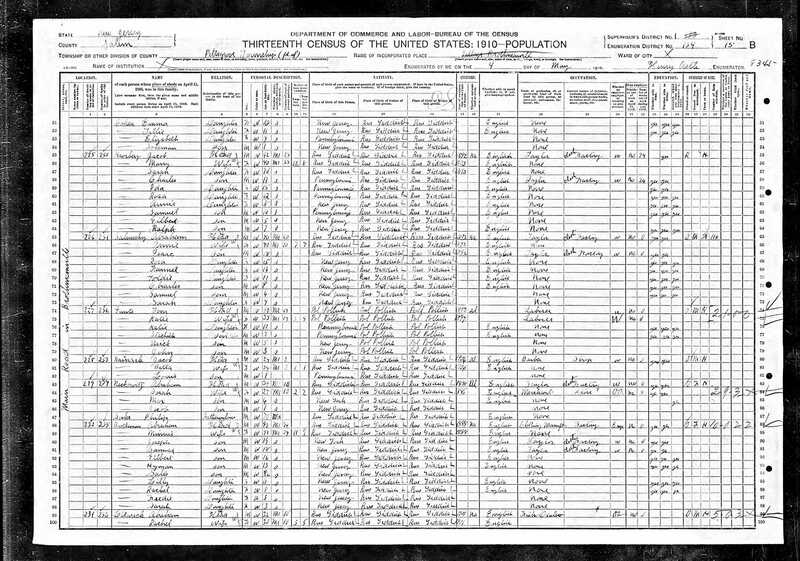 Looking at the 1900 census report for Abraham, by 1900 he and his wife, Minnie Hollender, had been married for 13 years and had had six children, five of whom were still alive. All six children were born in the US. Abraham reported that he had arrived in the US in 1884, three years before marrying Minnie. Their children as of 1900 were Joseph (10), Samuel (7), Gilbert (6), Nephtaly (later Herman) (4), and Leah (2). 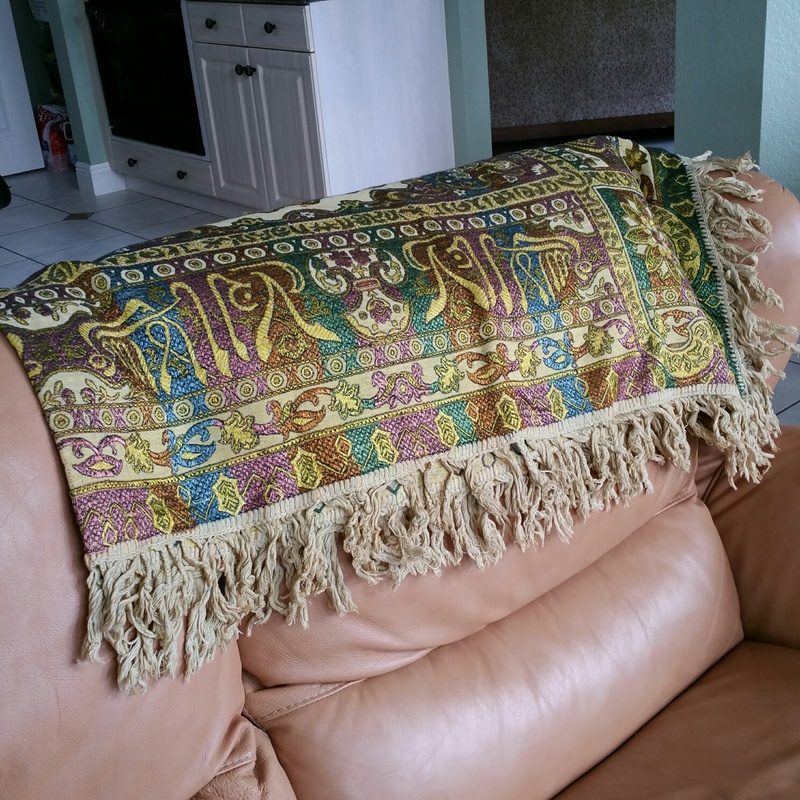 They were living in Pittsgrove, New Jersey, and Abraham was working as a manufacturer. 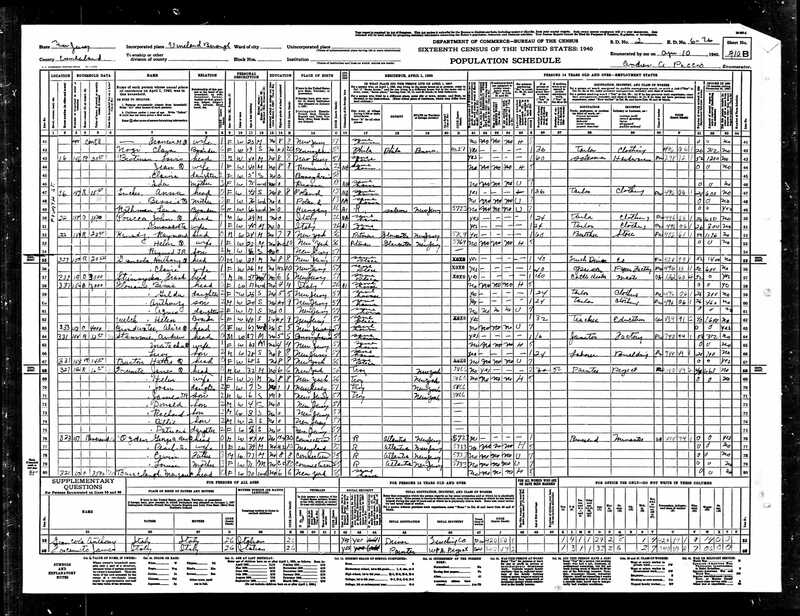 The 1910 census for Abraham and his family is only somewhat consistent with that of the 1900: his age is 47, still giving him a birth year of 1863, but now his birthplace is reported as Russia. He and Minnie now reported that they had had eleven children, nine of whom were still alive. In addition to the five listed above, there were three more daughters and one more son. The 1920 census reported one more child and once again had Abraham’s birthplace as Austria. However, he now claimed to be 48, thus born in 1872, not 1863 as previously reported. Later records also made him ten years younger than had been reported on the 1900 and 1910 census reports. Genealogists generally assume that the records closest in time are more likely to be accurate than those later in time (and people are more likely to make themselves younger as they get older), so I am inclined to assume that Abraham was born in 1863. It also makes more sense that he was 21 when he immigrated, not 11. But where was he born? Austria? Russia? And in what city or town? Since both the 1930 and the 1940 census reported his birthplace as Austria, I am inclined to discount the 1910 and assume that the 1900, 1920, 1930 and 1940 census reports indicating his birthplace as Austria are more accurate. And, of course, “Austria” meant within the Austria-Hungary Empire, just as it did for my great-grandparents and many other immigrants from that region, including Galicia. But then where more specifically was he born? Unfortunately, I’ve not been able to find a death record for Abraham, and the death records I have for his children are no more specific. 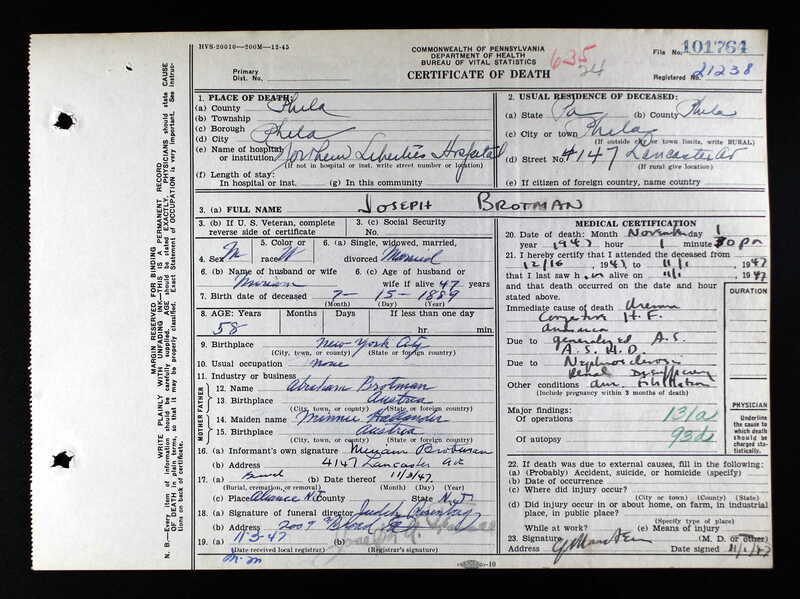 For example, the death certificate for his oldest child, Joseph, only reports that his father’s birthplace was Austria. Samuel’s death certificate says that his father’s birthplace was Russia. Abraham’s youngest child, Aaron, who was born in 1911, died as a young man in 1939 from heart disease. 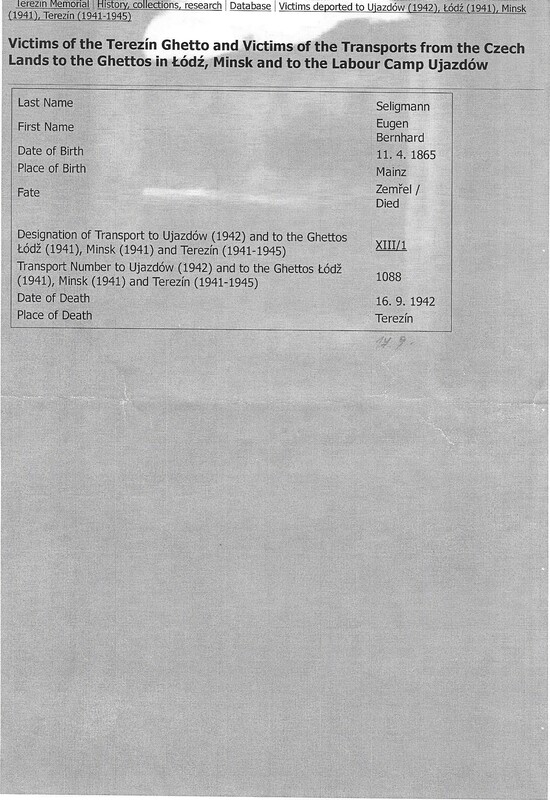 His death certificate indicates that his father was born in Austria. Those were the only sources I have located so far that reflect anything about where Abraham was born. I also had no records of what his mother’s name was nor did I have any indication of full siblings for Abraham, only the half-siblings born through his father’s second marriage. So I then turned to Abraham’s father Moses and his children to see if there was more to learn through their records. 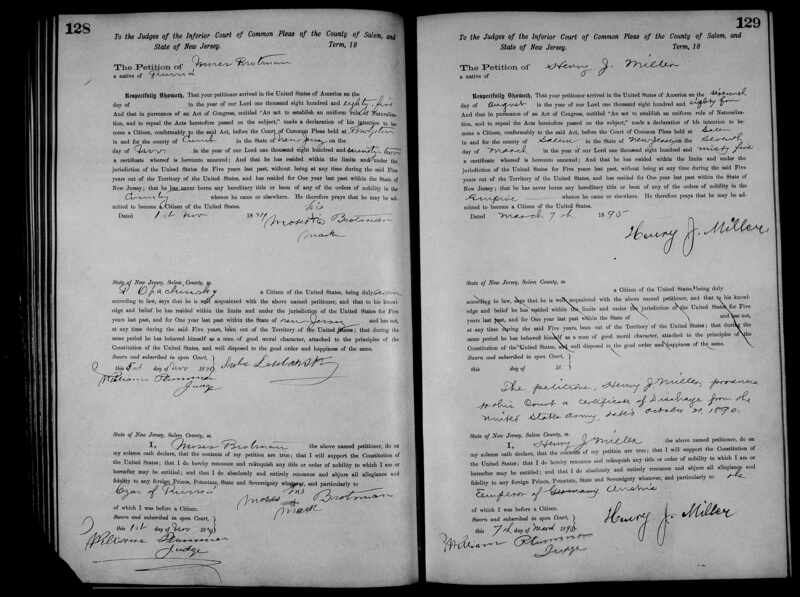 The earliest record I had found for Moses was his petition for naturalization, filed in 1894. It had his birthplace as Russia. It also said that he had arrived in the US in 1885. 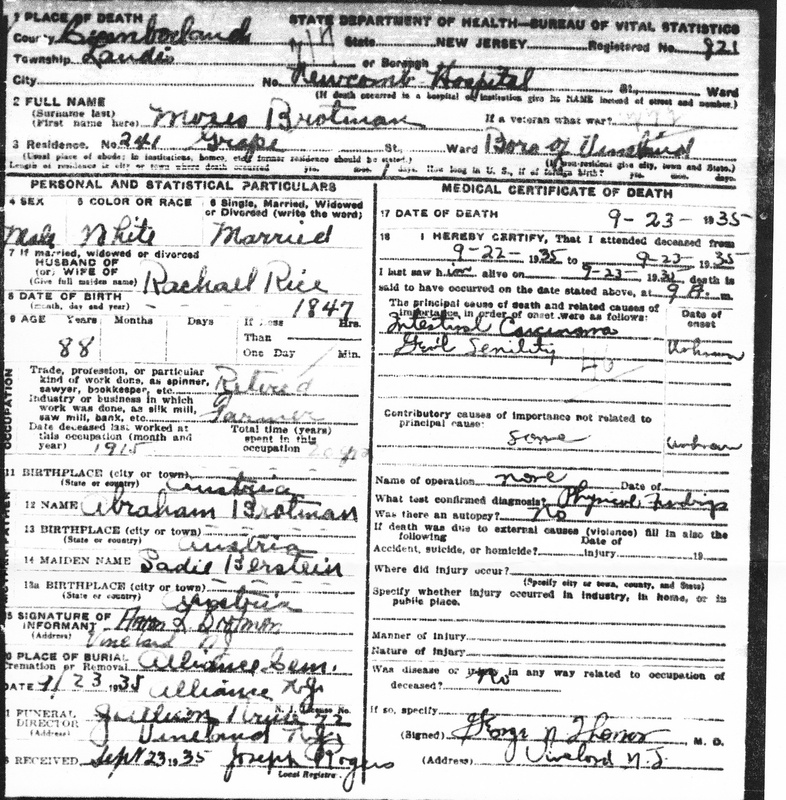 Moses Brotman Petition for Naturalization “New Jersey, County Naturalization Records, 1749-1986,” images, FamilySearch (https://familysearch.org/pal:/MM9.3.1/TH-1971-29863-26750-98?cc=2057433&wc=M73R-4NL:351145001,351187001 : accessed 14 May 2015), Salem > Petitions for naturalization 1888-1895 > image 95 of 96; county courthouses, New Jersey. 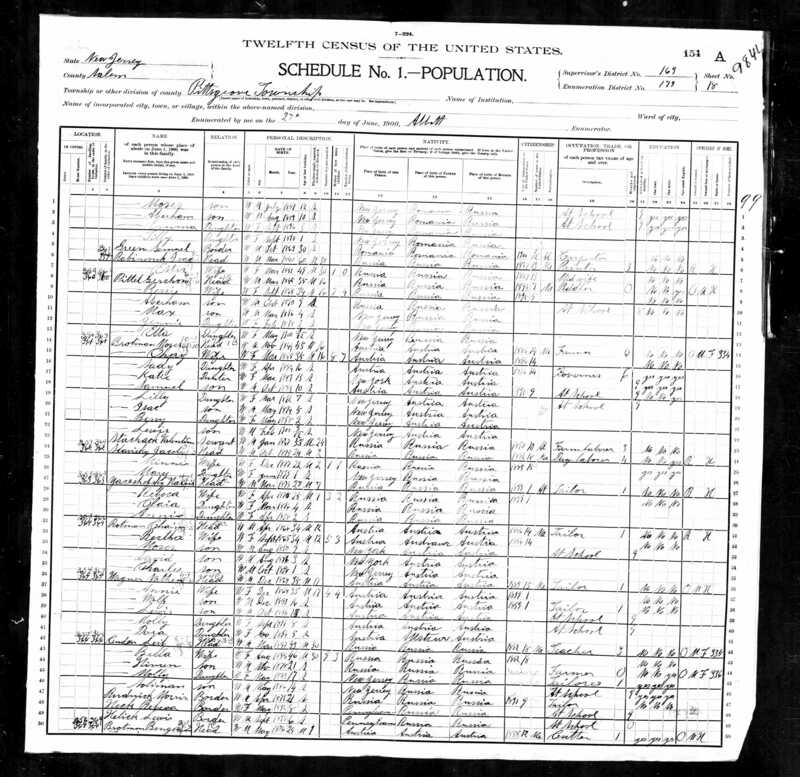 The 1900 US census reported his birthplace and date as Austria in November 1844. It also reported that he had immigrated in 1886 and that he was a farmer. Like his son Abraham, he was living in Pittsgrove, New Jersey with his wife “Chay” (probably Chaya), to whom he’d been married for sixteen years. (Abraham was already 37 in 1900, indicating that Abraham was not Chaya’s son.) Moses and Chaya had had eight children, seven of whom were alive, according to the 1900 census. The seven were Sadie (16), Katie (13), Samuel (10), Lilly (7), Isaac (5), Bessy (2), and Lewis (three months). The youngest four were born in New Jersey, Katie in New York, and Sadie and Samuel reportedly in Austria. Of course, that made no sense to me—if Katie was older than Samuel, how could he have been born in Austria if she was born in New York? 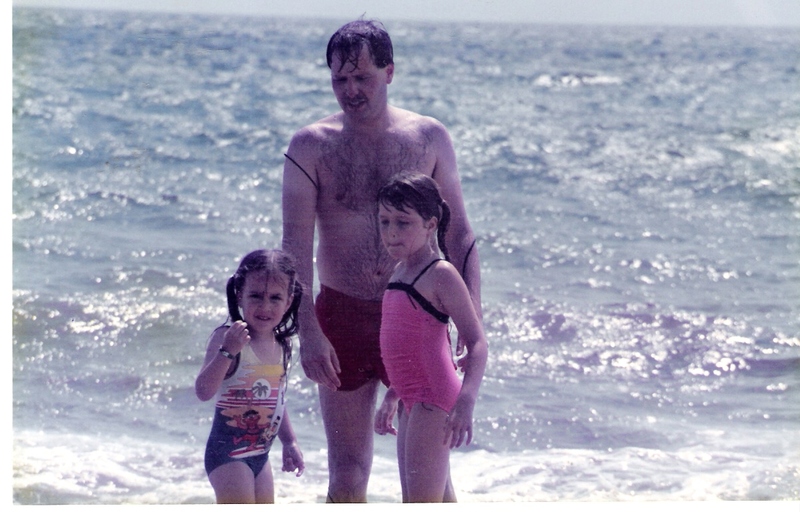 Had Moses and Chaya returned to Europe at the time Katie was born? Or was the census just in error? If they really had immigrated in 1886 and if Samuel was 10 in 1900, he must have been born in the US. The other thing that struck me as very strange about this report was the fact that Moses had a son named Samuel as did his son Abraham. In 1900 Moses’ Samuel was ten; Abraham’s was seven. So Abraham’s son Samuel had an uncle three years older with the same name. When I turned to the 1910 census report for Moses and his family, that became even stranger, as now Moses had had another child, a son named Joseph, who was seven as of 1910. Abraham also had a son named Joseph, who was seventeen in 1910. So Abraham’s son Joseph had an uncle Joseph who was ten years younger than he was. 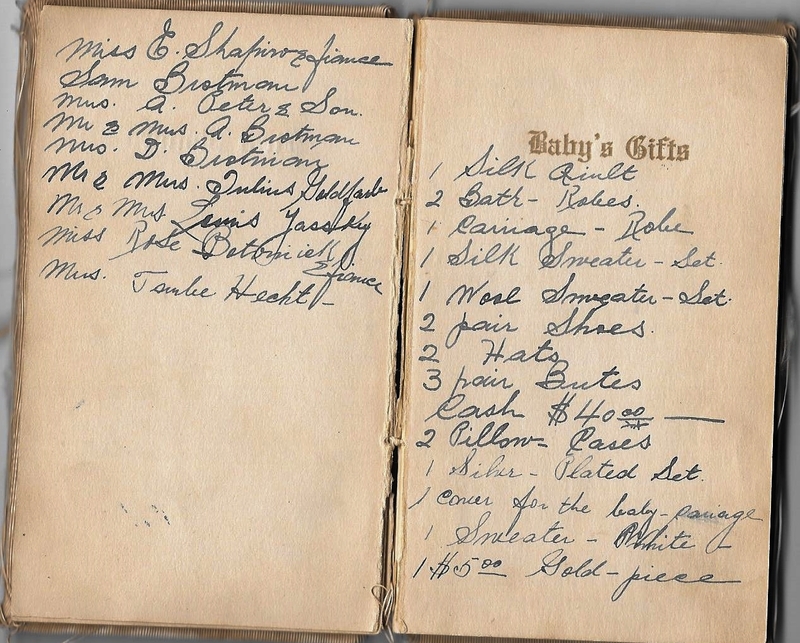 In addition, both Moses and Abraham had daughters named Lilly or Lillian; Moses’ daughter was born in February 1892; Abraham’s daughter was born September 5, 1898. Why would Moses and Abraham have given their children the same names? Perhaps they were named for the same ancestors, but it must have been awfully confusing in Pittsgrove to have two Samuel Brotmans., two Joseph Brotmans, and two Lilly Brotmans running around that small community. It sure doesn’t help genealogists either. The 1910 census report for Moses now had his wife’s name as Ida, which was a common Americanization of Chaya. Moses was now working as a presser in a clothing factory, presumably the one owned by his son Abraham. As with the 1900 census for Abraham, Moses’ birthplace is now given as Russia, not Austria. He and Ida had six of their children living with them: Samuel (20), Lilly (15), Isaac (14), Bessie (12), Lewis (10), and the above-mentioned Joseph (7). The birthplace for all the children was New Jersey, except for Samuel, whose birthplace was reported as Russia, same as his parents. Sadie and Katie were no longer living with their parents. Unfortunately, I have not yet found any records for what happened to Sadie or Katie, although their father’s obituary revealed their married names and their residence as of 1935 in Philadelphia. 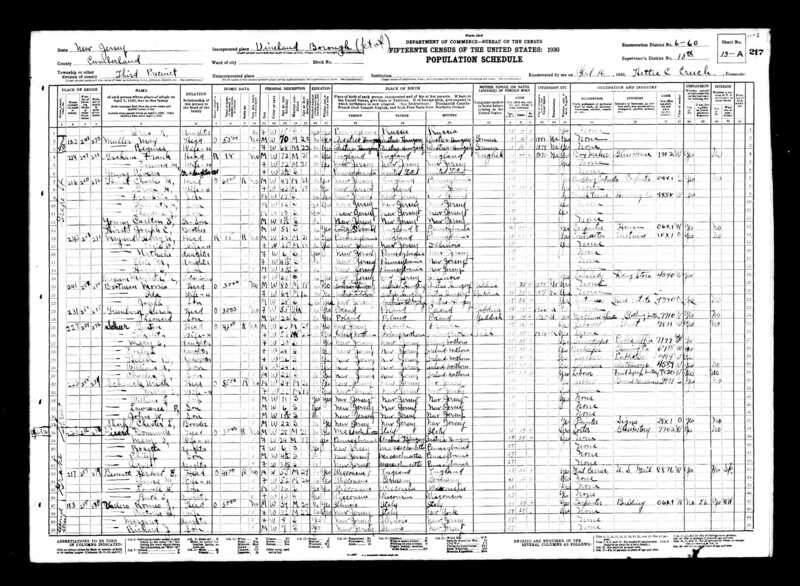 It took me forever to track down Moses Brotman and his family on the 1920 census, and although I am not 100% certain this is the right family, I am fairly certain that it is. The head of household is Morris Brotman, wife Clara—another common Americanization of Chaya. Morris was reported to be 70 years old, so born around 1850, not far off from his birthdate on the 1900 census. Birthplace is given as Russia for Morris, Austria for Clara, and it reported that immigrated in 1887, close to the 1886 reported in 1900. The most convincing support for this being the right family are the names and ages of the children: Lillian (21), Louis (20), Bessie (19), and Joseph (17). Although Lilly would have been 25 and Bessie 22, the sons’ ages are accurate; maybe they lied about the daughters’ ages to make them appear more “marriageable.” The family was now living in Philadelphia, not New Jersey, which at first I found odd. But then I checked for the older sons, Samuel and Isaac (now Irving) and found that both had married between 1910 and 1920 and were living in Philadelphia. Although I still have not located the two older daughters Sadie and Katie, perhaps they also had married by then and moved to Philadelphia. Maybe Moses and Ida/Clara/Chaya also moved there to be closer to all their children. Thus, I now had conflicting birthplaces for Moses—one census said Austria, two said Russia. I looked at the 1930 census, and once again there was a conflict. Now Moses’ birthplace was reported as Austria-Hungary, then crossed out with “Europe” written above it. His parents’ birthplace, however, was given as Austria-Hungary. Moses was now 80 years old, and he and his wife (now Ida again) and their youngest son Joseph (28) were living in Vineland, New Jersey, near Pittsgrove. So as with Abraham, the birthplace for Moses fluctuated back and forth between Russia and Austria with no specific town or city mentioned. Perhaps Moses really did not know where in Europe he was actually born. Moses died on September 23, 1935. 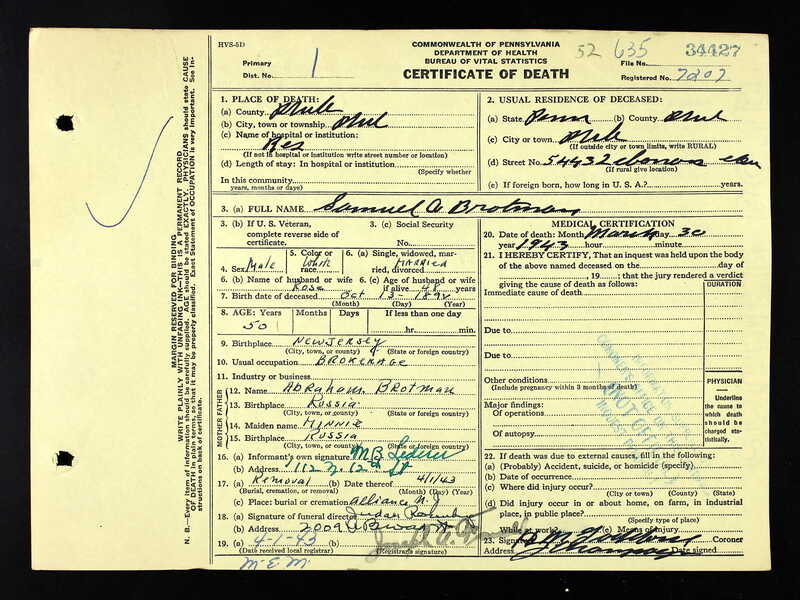 His death certificate said he was born in Austria in 1847 and that his parents were named Abraham Brotman and Sadie Berstein, also born in Austria. His grandson Aaron Brotman was the informant, Abraham’s youngest son who would die himself just a few years later. Moses’ wife’s name was given as Rachel Rice. This has caused considerable confusion for the family. Was this a third wife? A mistake? In the obituary for Moses, it says he was survived by his widow, but did not name her. It did, however, name all his children (including the married names for Sadie and Katie, as indicated above) and their residences. 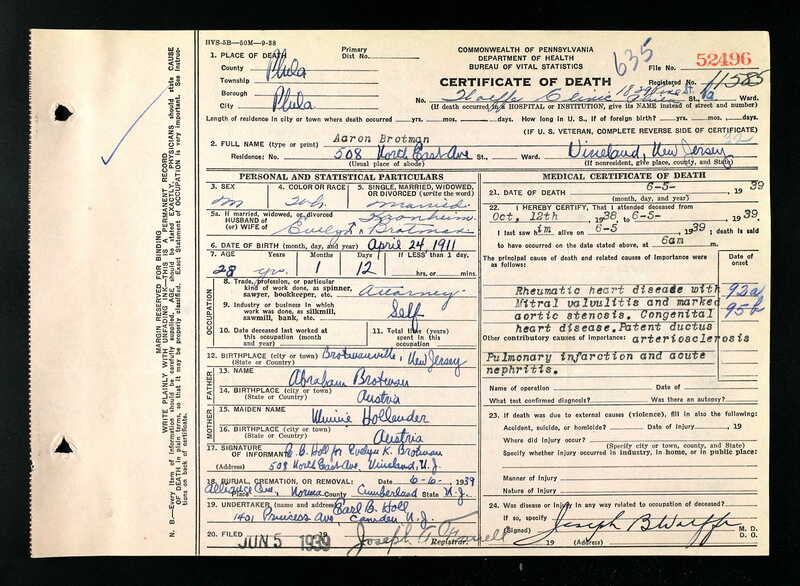 I found the death certificate for his youngest child, Joseph, who died less than a year after his father on July 26, 1936, from bacterial endocarditis. He was only 34 years old. On his death certificate, Moses’ birthplace is once again given as Russia, and Joseph’s mother’s name is reported to be Rachael Rice. The informant was Joseph’s half-brother, Abraham Brotman. Since Moses’ wife on the 1910 census was Ida and since Joseph was born in 1902, it would seem likely that Ida was Joseph’s mother. Or could Chaya have been Rachel Rice and then died after Joseph was born? Was Ida a third wife? And was she the same woman as Clara, the wife listed on the 1920 census, or was that a fourth wife? My own personal hunch was that Rachel, Chaya, Ida and Clara are all one and the same person. 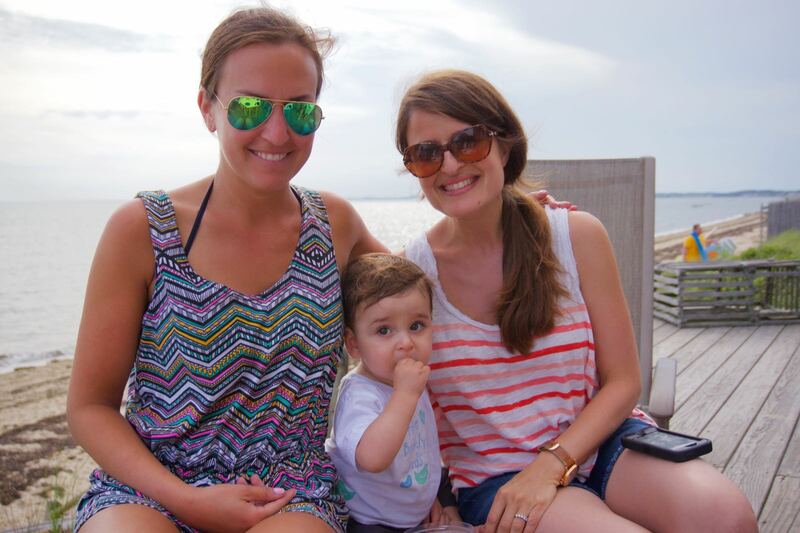 Notice that the mother’s name was Chai Reis on the first, then the more Americanized Clara Rice on the later one. These were both created before the 1900 census listing of Moses’ wife as Chaya, the 1910 listing as Ida, the 1920 listing as Clara, or the 1930 listing again as Ida. Notice that the surname is Reis/Rice, the same surname given for Moses’ wife on his death certificate in 1935 and that of his son Joseph in 1936. I find this last bit of evidence enough to conclude that Rachel Rice was the same woman who married Moses in 1884 or so, immigrated with him and their first two children, and gave birth to and raised nine children from Sadie, born in 1884, through Joseph, born in 1902. In 1940 after Moses had died, Ida (aka Chaya-Clara-Rachel) was living with her son Lewis and his wife Jean and their daughter Elaine in Vineland, New Jersey. According to Elaine, Ida died about three years later. Unfortunately I have not yet located a death record or obituary for Ida. 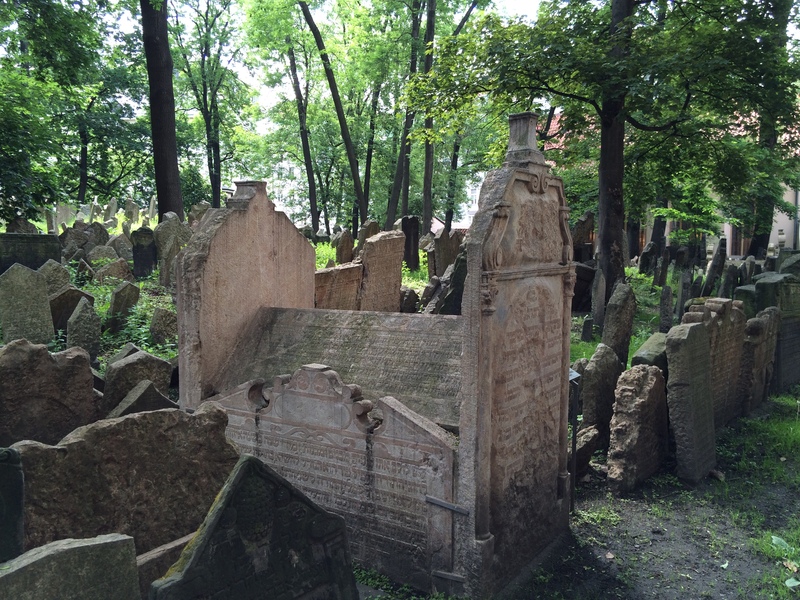 Thus, reviewing all the records I had found had not brought me any closer to learning exactly where Moses Brotman or Abraham Brotman had been born or where they had lived in Europe. But while searching, I stumbled upon something else. I will report on that as my last post before I leave for my trip. Relatives of the Brotmanville Brotmans say family lore is that the family was from Preszyml, a town about 90 miles from Tarnobrzeg, Grebow, and Radomysl nad Sanem, the other ancestral towns where possible family members lived. But I have not found any record supporting that family lore. 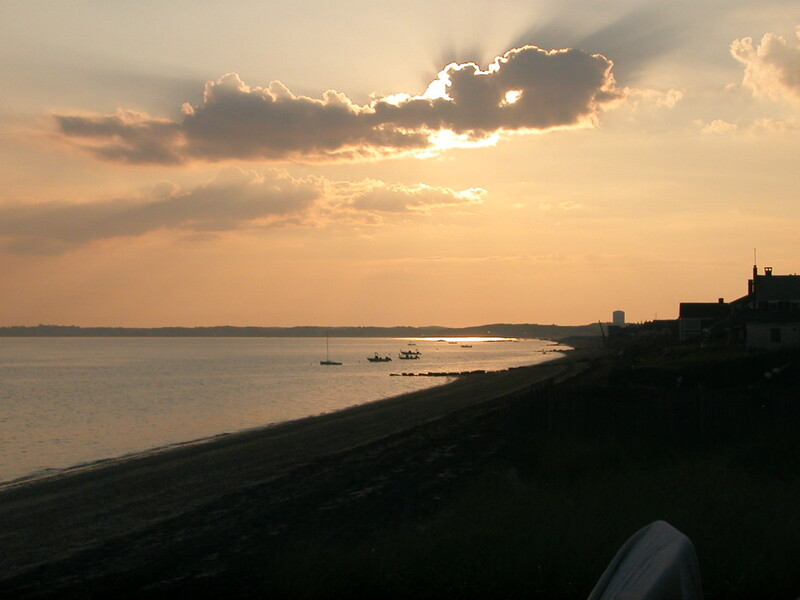 A few geographical facts are necessary to understand the locations discussed in this post. Brotmanville is an unincorporated community within the township of Pittsgrove so Pittsgrove is listed on the census records, not Brotmanville. The colony where Baron de Hirsch and others created the farming settlement for poor Jewish immigrants was called the Alliance Colony. 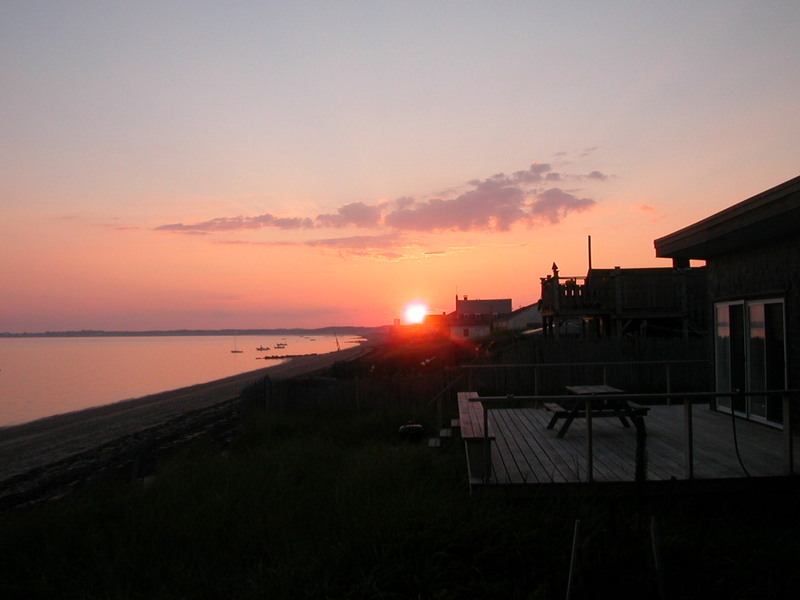 Vineland is a neighboring community where many of the Brotmans lived over the years. As I’ve learned about the numerous members of my Seligmann family who were killed during the Holocaust, one of the questions that has bothered me was whether or not their American relatives were aware of what was going on in Germany. This, of course, is part of the larger question of what Americans, Jewish or not, knew about Hitler and his plans to murder the world’s entire Jewish population. Certainly people were aware of the anti-Semitic laws and practices, of Kristallnacht, of some violence against Jews, but to what extent were they aware of the seriousness, the severity of the situation, of the plans for genocide? We all know stories of immigrants who were denied entry, including full ships turned away from American ports. Historians have written about the failure of the Roosevelt Administration to respond to pleas for help from those who were very much aware of what was happening in Germany and elsewhere in Europe. But what did my own family know? Did my Seligman relatives here in the US know what was happening to their cousins in Germany? In 1935 when the Nuremberg Laws were enacted in Germany, depriving Jews of their citizenship and imposing many other restrictions on their lives and livelihoods, both my great-grandmother Eva Seligman Cohen and her younger brother James Seligman, my great-great-uncle, were still alive (their youngest brother Arthur had died in 1933). Did they even know they had cousins living in Germany? Were they in touch with them? Did they know what was going on there? To some extent those questions now have some answers, thanks to a series of letters from and to Fred Michel sent to me by his children. Fred Michel’s grandfather August Seligmann was the younger brother of Bernard Seligman, the father of Eva and James and my great-great-grandfather. Fred was thus the first cousin once removed of my great-grandmother and her brother. I wrote previously that in Fred Michel’s citizenship application he had identified James Seligman of Santa Fe as his sponsor for immigrating to the United States in 1937. 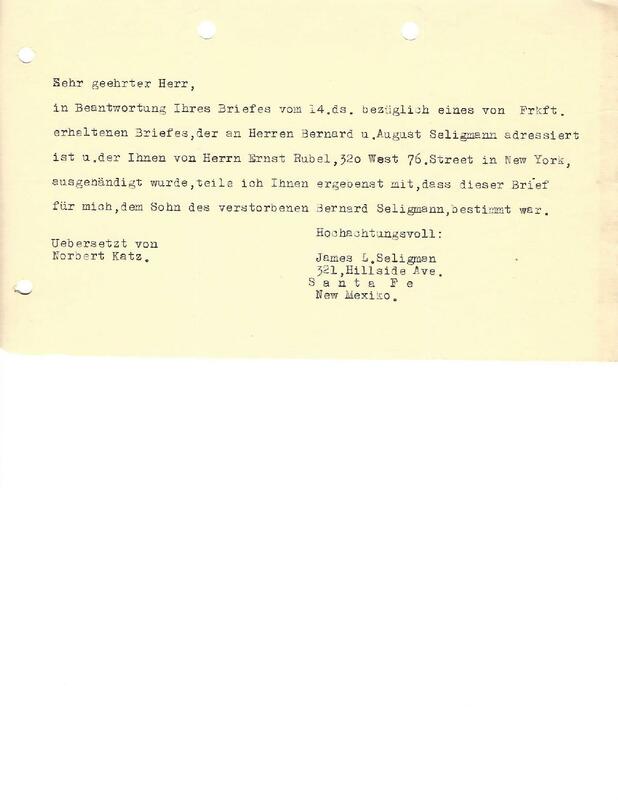 Fred’s children have some letters written by James Seligman regarding the immigration of his German cousin that shed some light on my questions. 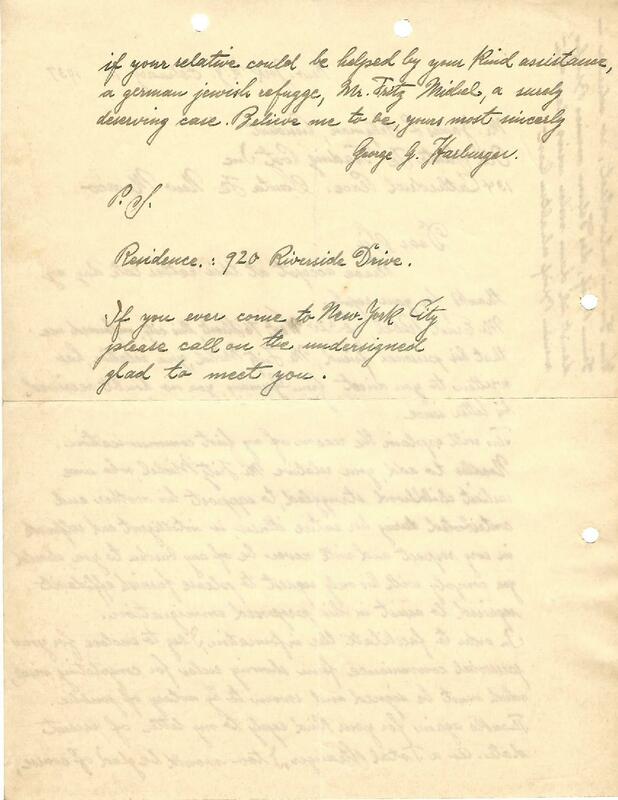 The earliest letter in this particular collection is one from James Seligman to George G. Harburger of Metropolitan Life Insurance in New York City, dated December 22, 1936. 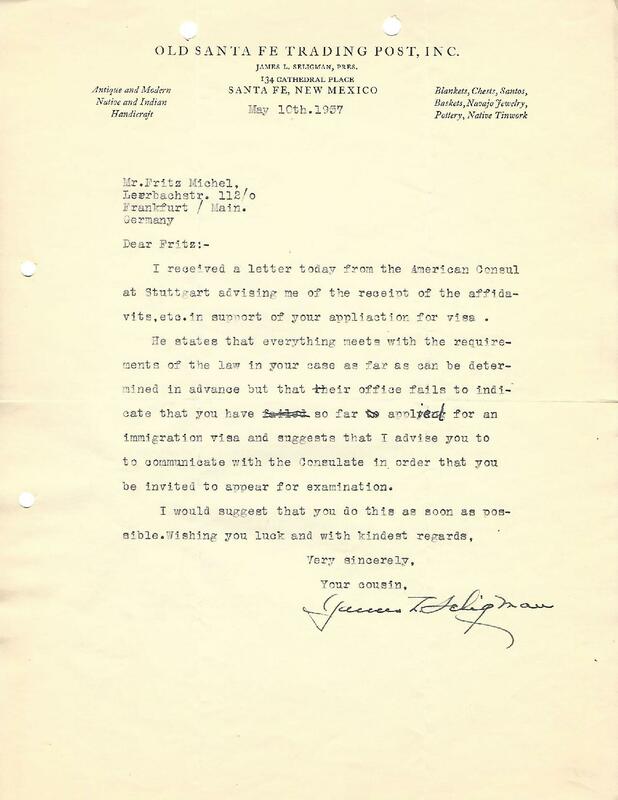 In this letter, James was writing in response to a letter from Mr. Harburger regarding a letter that had been sent from Frankfort, Germany, to Bernard and August Seligman, which an Ernest Rubel had delivered to Harburger. Ernest Rubel was the person whom Fred Michel later listed on his naturalization application as the person to whom he had been coming when he arrived in the US. 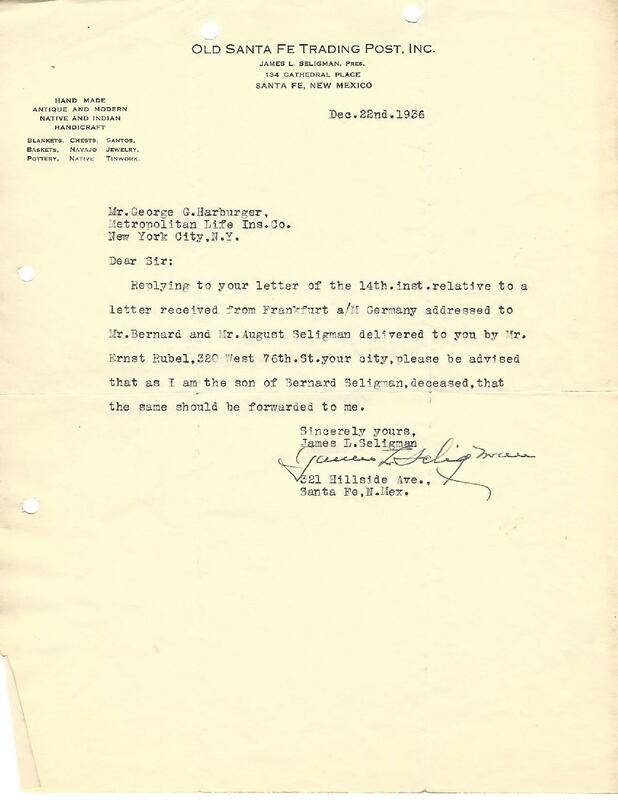 James requested that the letter be sent to him, as he was the son of Bernard Seligman. There follows a German translation of the same letter. I wonder whether James knew German or whether he had someone else do this translation for him. The next letter in the file is from James Seligman to Fred Michel. 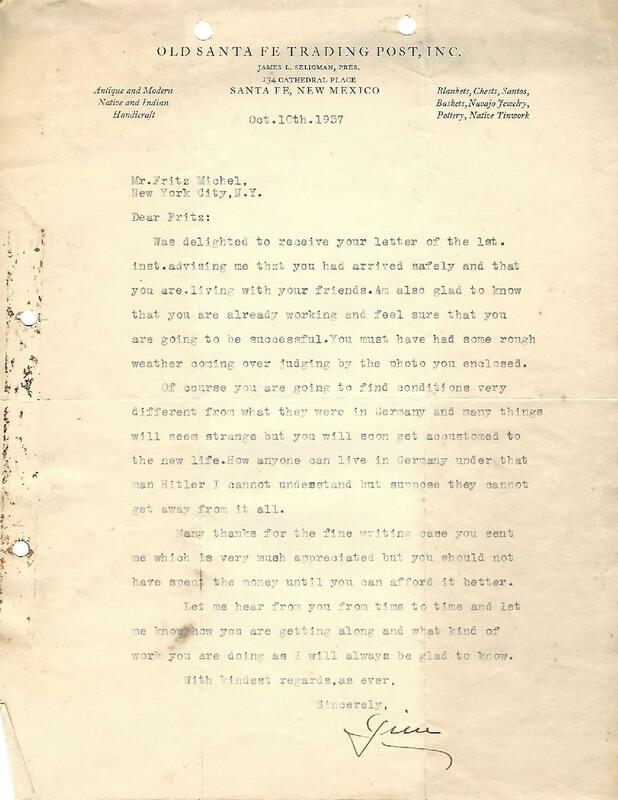 (Note that James addresses the letter to Fritz, which was Fred’s real name before he changed it after immigrating.) The letter is dated January 25, 1937, and in it James first described the American Seligmans—his father Bernard, his two uncles, Sigmund and Adolf, and his brother Arthur, all of whom had passed away by 1937, and then mentioned that only he and his sister were still living. His sister, of course, was my great-grandmother Eva. James then addressed the purpose of Fred’s letter to him: his desire to immigrate to the United States. James warned Fred about the unemployment situation in the US, although recognized that Fred had a friend in the US who could help him. Fred must have inquired about a possible job in Santa Fe with James, to which James replied, “As regards a job in this city, this would be out of the question as I only have a very small business myself with only one employee and which is all it will stand.” By 1930, James Seligman was no longer affiliated with Seligman Brothers and had formed his own business, the Old Santa Fe Trading Post, which must have been the business to which he was referring in his letter to Fred Michel. Fred might very well have been taken aback by this flat-out refusal to help him find a job in Santa Fe. 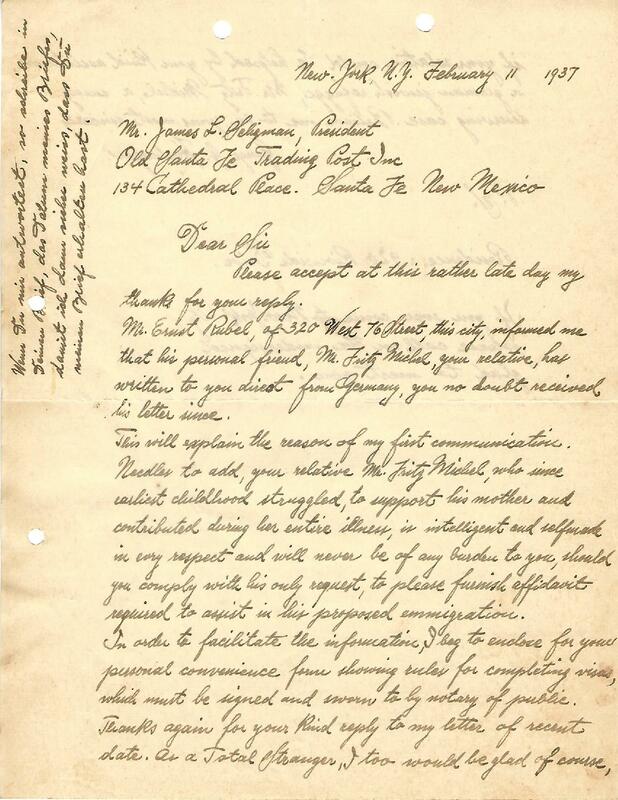 But James agreed to help Fred by sending an affidavit in support of his immigration and closed by wishing him the best and expressing hopes to meet him some day. On February 11, 1937, George Harburger wrote to James Seligman to persuade him to help. It appears from the letter that Ernest Rubel, Fred’s personal friend, had contacted Harburger to ask him to contact James for help. I am not sure of the various connections there, but George described Fred as someone who had supported his mother all his life and as an intelligent and self-made man who would “never be a burden” to James and then instructed him how to submit an affidavit in support of Fred’s immigration. Attached I’m sending you the missing papers for your examination. Obtaining the papers I had to learn that my landlord didn’t register me for 3 month (from March until May 1933). Please find the reason for that in the authentication attached. Also you can find in attached transcript of my certificate where I was working during that time. If you wish I can bring the original paper with me. The County Department of Bingen /Rh. ( at the Rhine), where I complained about my certificate of good conduct four times, just sent me the information that the required paper was given to post it to Stuttgart on May 3 to your address. I own a proper passport. If I won’t hear from you, I’ll assume that my papers are in order. Reading this letter after I’d had it translated made me angry; it so clearly reflects how difficult some in Germany were making it for Fred to be able to leave, but also how difficult the US was making it for him to arrive. 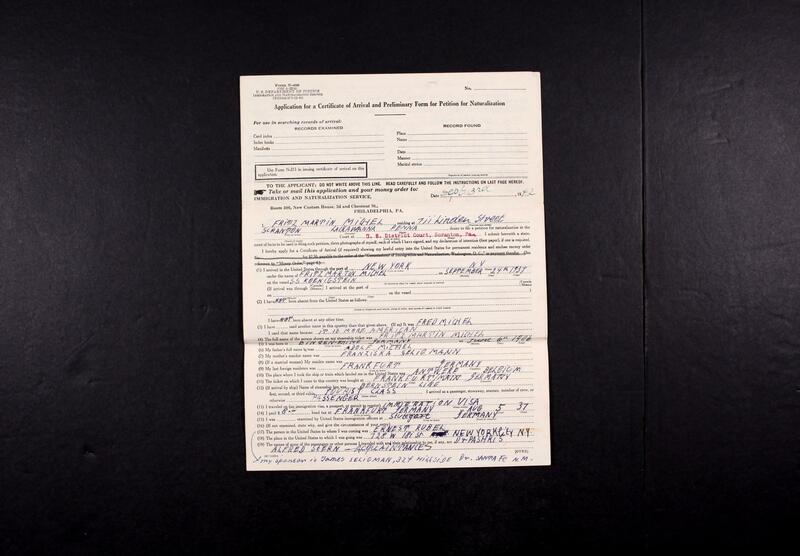 From other documents we know that Fred Michel was finally allowed to immigrate and arrived in the US on September 24, 1937. 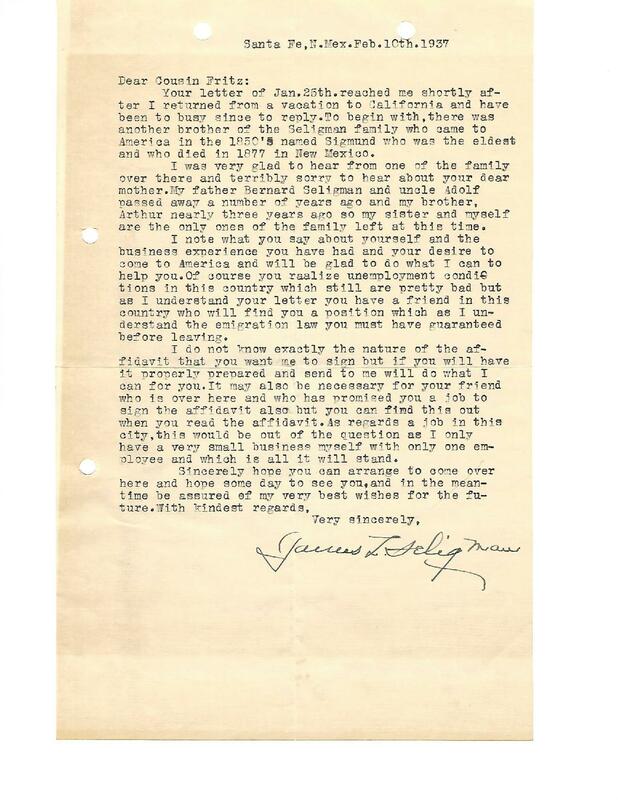 On October 10, 1937, his cousin James wrote to him again, welcoming him to the United States. 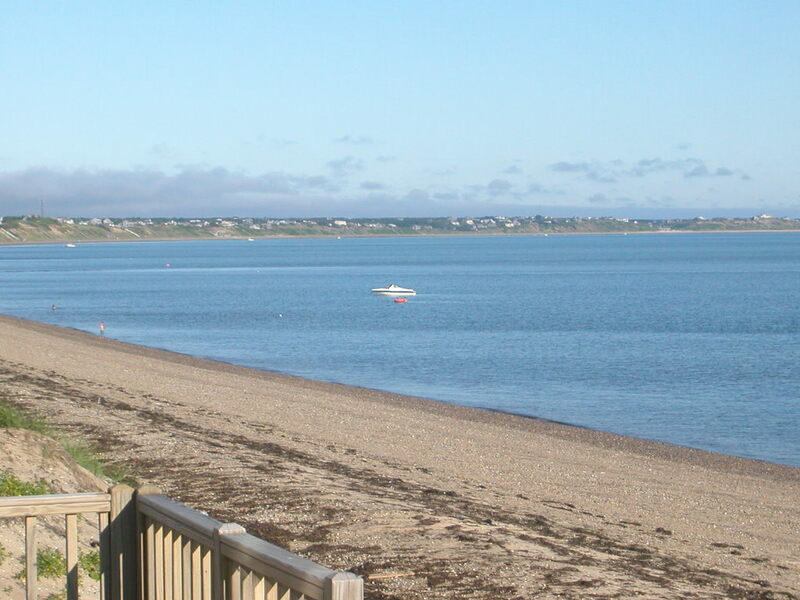 Fred must have enclosed a photograph in his letter to James telling him of his arrival because James referred to it as indicating the Fred must have encountered bad weather while crossing the ocean to America. Fred also must have told James that he had landed a job and was living with friends. I found the next paragraph of this letter very telling. James warned Fred that it might take some time to adjust to his new country and then said, “How anyone can live in Germany under that man Hitler I cannot understand but suppose they cannot get away from it all.” What did he know about Hitler as of September 1937? Were his feelings shared by Americans in general? And isn’t it also revealing that James, the son of a man who had left Germany behind about 80 years earlier, could not imagine why others were not also leaving Germany as his father and Fred Michel had done? Would James have found it so easy to leave his homeland if the shoes were on the other feet? James then thanked Fred for a gift he had sent him—a writing set—but says Fred should have saved his money until he “could afford it better.” Was this insulting to Fred as patronizing? Or did he see it as an older cousin’s concern? James closed by saying, “Let me hear from you from time to time and let me know how you are getting along and what kind of work you are doing as I will always want to know.” Although I read this as genuine interest and concern, it is not at all clear to me that Fred and James maintained much or any future contact. Fred’s children seemed to believe that they did not. In any case, James died on December 15, 1940, just three years after Fred’s arrival in the US. 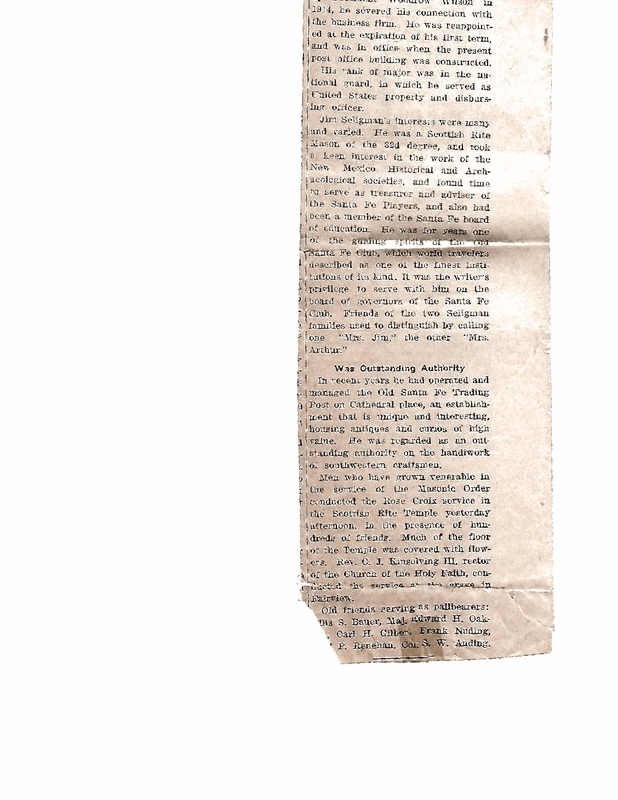 Among Fred’s papers was an obituary for his cousin James that he must have saved for many years. I had not seen this obituary before, and I do not know in what paper it was published or the date and page. 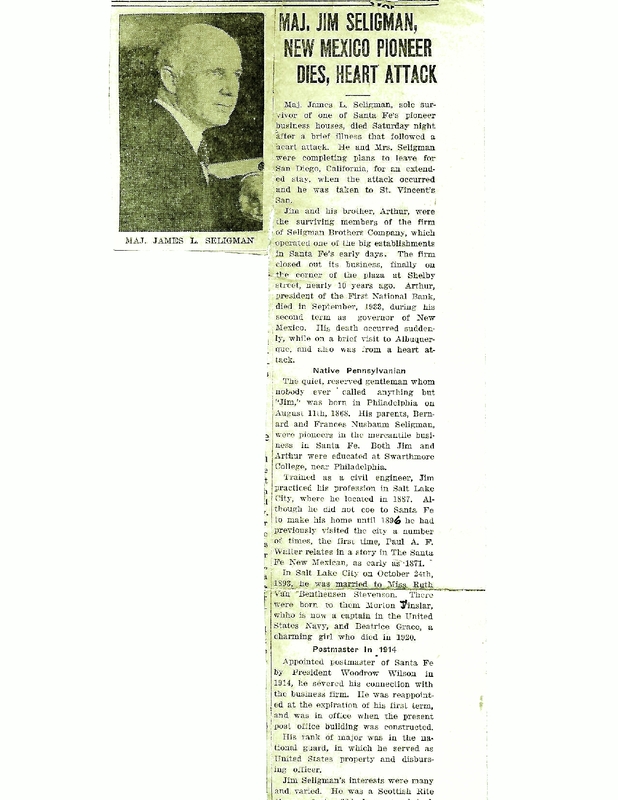 I will not transcribe its content here, but will add it to the post I wrote quite a while back about James Seligman. The next letter in this file was written many years later. On October 9, 1975, Fred wrote the following letter to Mrs. Randolph Seligman of Albuquerque, New Mexico, thinking she might perhaps be a relative, and identifying his own background and his connection to James Seligman of Santa Fe. 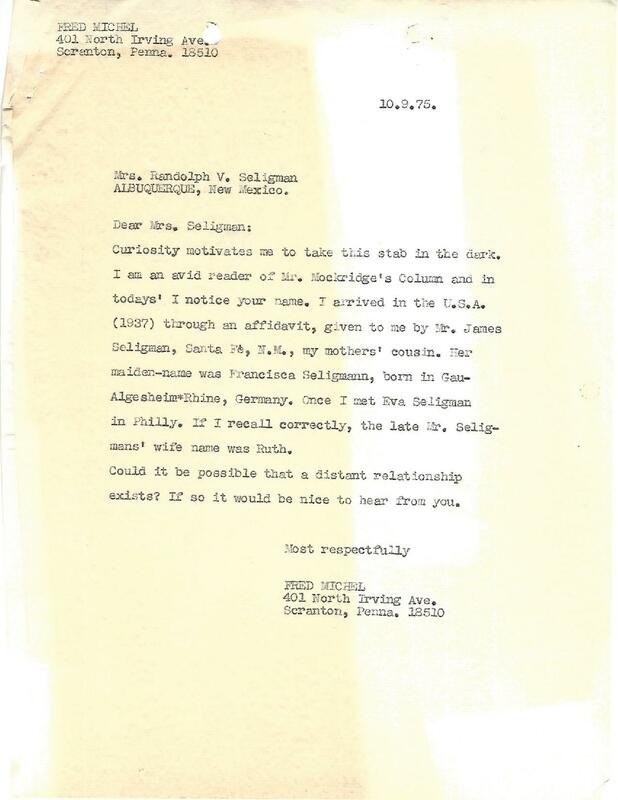 Of greatest interest to me in this letter is this short reference to my great-grandmother: “Once I met Eva Seligman in Philly.” My great-grandmother died in October 1939, just two years after Fred arrived. My father was living with her at the time that she likely met Fred Michel. He doesn’t remember him, though he said the name was familiar, but probably from reading it on the blog. From what I have learned about my great-grandmother, she was a warm and welcoming person who had several times taken in relatives in need. I wish I knew more about her meeting with her German-born cousin Fred Michel. Mrs. Randolph Seligman responded shortly thereafter that although she was not a relative of the Santa Fe Seligmans, the Santa Fe phone directory listed a William Seligman and a Jake Seligman living in Santa Fe. [These were the sons of Adolph Seligman, about whom I wrote here.] She said they had once met William, known as Willie, years before in his clothing store in Sante Fe. In November 1975, she wrote again, commenting that it was strange that the two New Mexico families did not know each other, but attributed that to the fact that “they married non-Jews and became affiliated with the Episcopal Church.” Near the end of her letters she spoke of plans to visit with Willie Seligman in Santa Fe and identified him as a relative of Arthur and James Seligman. Fred responded to her on January 5, 1976, expressing his delight that she had written to him again and filling her in on his family. But within what is otherwise a newsy and cheery letter are two sad passages. After referring to some relatives he remembered from Germany, Fred wrote, “As I write these notes I am amazed how much I know about my family when one considered I left “home” when I was 18, never to return. Finally, in 1972 while in Europe I contacted some survivors. It was an emotional experience we never forget. Some I haven’t seen since Hitler came to power.” For me, this is a powerful statement in its own understated way. Here was a man who had left everything behind yet even he is surprised by how much he still remembered of his family and his past. The other disturbing passage in this letter is in the following paragraph where Fred wrote about the travel plans he and Ilse had made in 1974, including to Santa Fe, where Fred had relatives, and to Georgia, where Ilse had relatives. 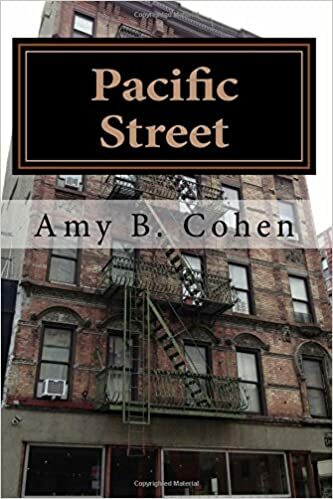 Fred wrote that they had discarded those plans “as Ilse reasoned that in spite of her writing after arriving here, she never received an answer and the same goes for my relatives in S.F. [Santa Fe].” How sad that so many years later Fred and Ilse both still felt hurt by the fact that their American relatives had not stayed in touch with them. I don’t know how to reconcile that with the welcoming letters that Fred received from James, but obviously there were some hard feelings there, whether justified or not. I just find it very sad that two people who had lost so much felt so abandoned by their American relatives. So what did those American Seligman relatives know by 1937 when Fred was trying to escape from Germany? They knew that they had German relatives, they knew that things were bad for Jews with Hitler in power, and they knew that there were at least some family members who wanted to leave Germany and come to the United States. Did they do enough? Of course, in retrospect nothing anyone did was enough, given the outcome of the Holocaust. And it is hard to know sitting here today what more any one individual could or should have done. Certainly James did what he was asked to do and helped Fred immigrate. Could he have given him a job? Could he or any of the Seligmans have reached out to these newly arrived cousins in a more committed way? I don’t know, and I can’t judge. But I do judge our government which closed its eyes and its ears for political and other reasons while thousands and eventually millions were killed. I don’t know why Fred wrote that he was 18 when he left home. The US records all give his birth year as 1906, and he came to the US in 1937 when he was 31, not 18. Perhaps he is referring to leaving home in a more specific way, not leaving Germany.